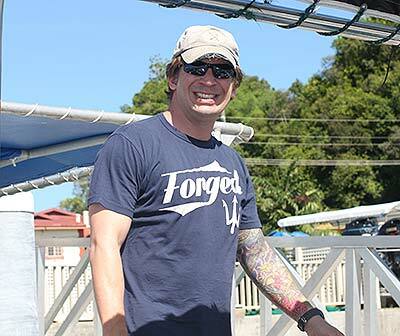 Project Recover Locates Avenger Found In Palau. 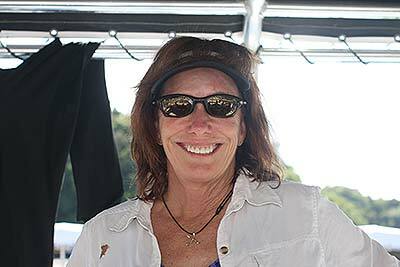 Mickalia Johnston is the first to check in from Palau! 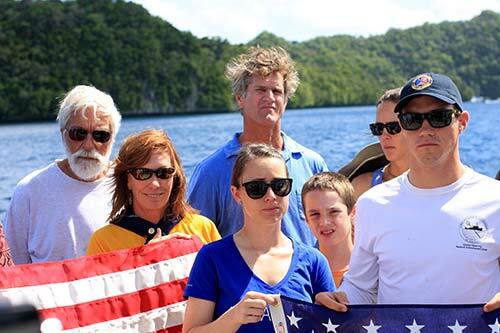 Five of us arrived in Palau last night 3.13.15, and the sweet smell of Palau was quite welcoming. Alii! [Hello! 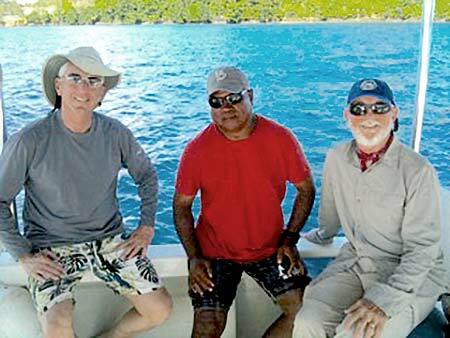 in Palauan] Three of us had been here multiple times, but for myself, it’s a wonderful first. We started the next morning off with a quite filling breakfast, topped off with Palauan Lemonade — tres bien! Our morning really got going with a visit to the local hospital, where Dr. Pat Scanon is a licensed provider. Graciously, they showed us their facilities, to include a review of the capabilities and operations of their hyperbaric recompression chamber. 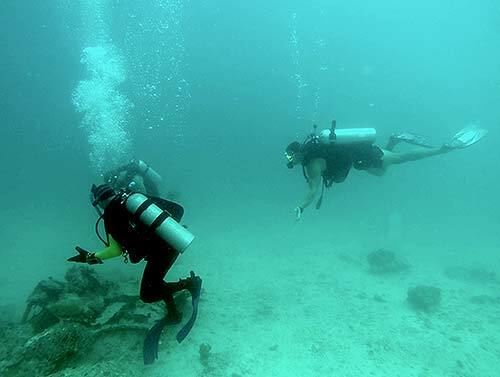 It is predominantly used for treating diving related illnesses, but plans are afoot to begin medical treatments as well. In a true testament to improvisation, while driving about, we came across a local lumberjack, removing limbs from a massive tree. Moreover, the rigging system in place to ensure correct limb landing was quite elaborate. And the night ended with a picturesque dinner overlooking Malakal harbor. A perfect ending to a beautiful day. Today started with our first mission brief and some wonderful local coffee. The day started off windy, but it still was about the most beautiful water I’ve seen. 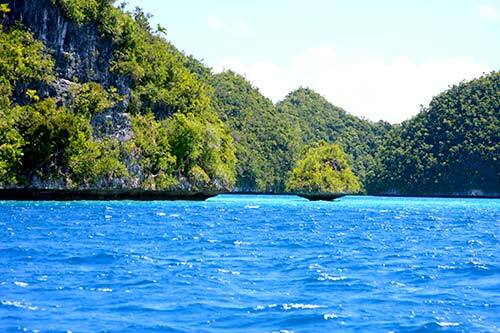 The turquoises and the rock islands are indescribable. We began with a “situational awareness” water visit to a few spots we thought were worthy of reviewed diligence. Ground truth wins! Looking at the lay of the water and hills, we are revising a few target plans. On to the checkout dive – a very nice boat wreck presented a great opportunity for us to practice getting our feet wet and our buoyancies established. I think each of us will be assimilating a take-home from this practice dive. Next, we spent just about the most beautiful surface interval one could ask for. 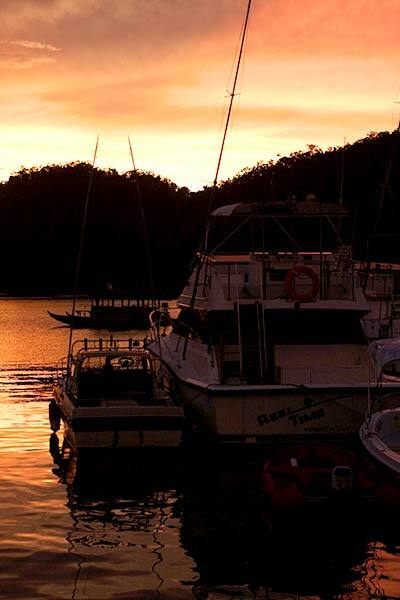 The professional tourism magazines have NOTHING on the beauty of some of the local rock islands and secluded harbors. 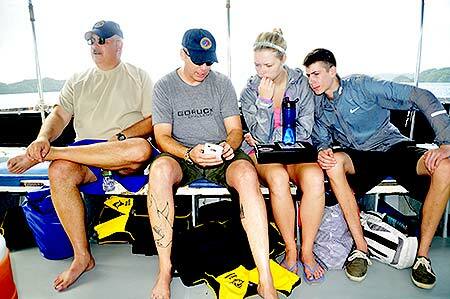 And then, we made our first real mission dive. 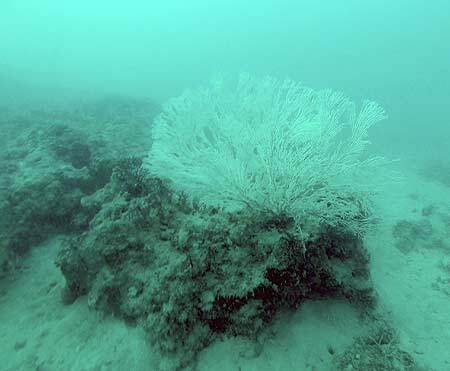 We wanted to work up a focus that had been identified using technology from Scripps Institute of Oceanography (SIO). 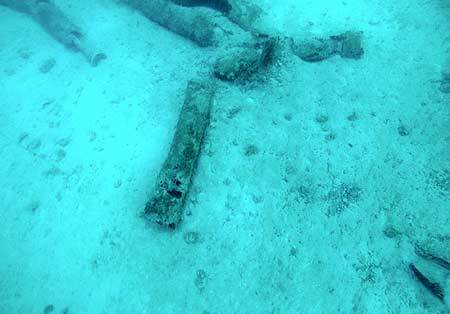 It was an anomaly on the ocean floor – in fact, it was a likely unrealized boat wreck! 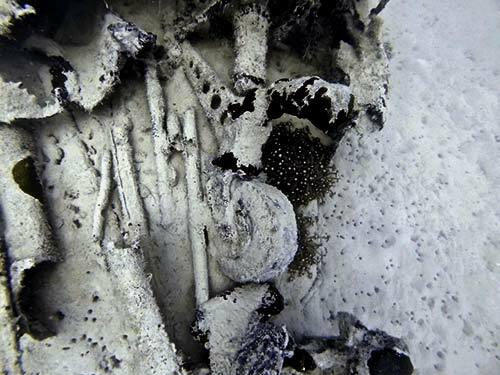 Initial observations suggested a Japanese boat of some type, which likely was on fire, as charred portions were found. It will take more characterization to further evaluate the origins, but success! On the first day. Thank you SIO! Today we started to settle into a routine. Another effective mission briefing and off to the water. 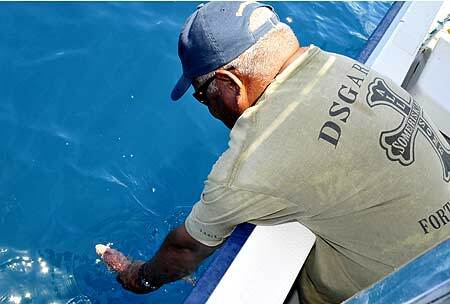 We began by searching for a shallow area, to better characterize previously discovered debris. It was shallow water and all snorkeling. Today was a very exciting day: we went to meet the President and other dignitaries. Thanks to their gracious benevolence and antecedent legwork, we have official permission and permits to dive in waters usually denied to people. Moreover, it was an amazing opportunity to see the countryside, both coasts, and the capitol. Lastly, it allowed for a small amount of R&R. They got to do all the admin work necessary to get up and running in country. Once the folks from Scripps Institution of Oceanography (known sometimes as SIO, Scripps, or those ‘really smart west coast ocean guys’) and the University of Delaware, School of Marine Science and Policy (known as UDEL, UD, or ‘those really smart east coast ocean guys’) showed up they got going in earnest on the water. I’m en route. There were no seats available on my company (I fly for Delta) out of Detroit to Tokyo, and although there were seats out of JFK airport today to Tokyo, a snowstorm was going to hit the northeast so I thought better and headed out west to see how I could get to Palau. I got to Portland, Oregon last night and am traveling to Tokyo and on to Palau today. I get in at 0100 on the 22nd. One thing about going via Hawaii instead of Japan, you do get in at a reasonable hour even if leaving is just as painful at 0420 and 0220 respectively for Tokyo or Guam. Warren Bruce will be joining up at the end of March. 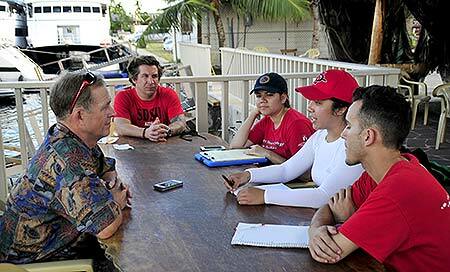 So will a group of three San Diego State University students that Derek is leading on a research project. I’ll let him tell you all the details about that as time goes on. 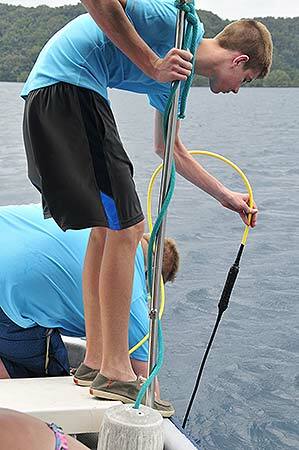 Stockbridge High School is coming out again with a new remotely operated underwater vehicle and new plans to be more successful in the field. 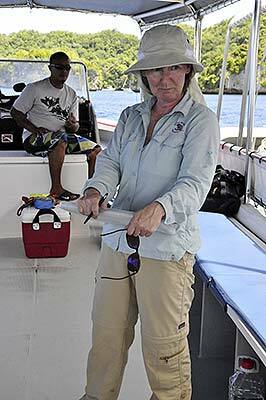 They are even doing a manta-ray tracking project in conjunction with some Palauan groups. 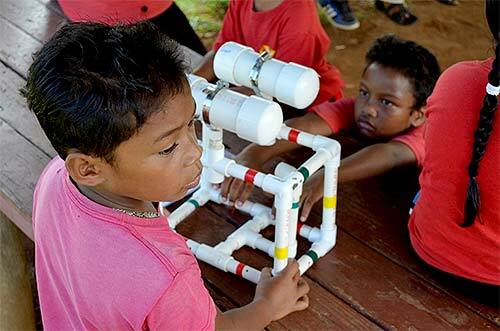 They are doing outreach into the Palau school system and teaching how to build ROVs to as many students as they can. 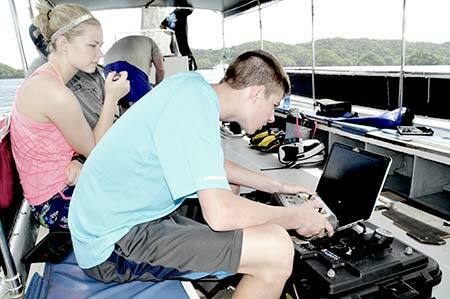 For anyone who uses Facebook (I am a Facebook dropout) check out Stockbridge High School Underwater Robotics. I’m sure I’m leaving someone out but I’ll do another update once I’m in country. But no update is complete without photos. So here are a few from last year. What Casey could see last year while hanging upside-down over a cliff, suspended by sticky vines. That’s the island of Ngerchaol across the channel from Arakabesan. Divers on a really clear day over the Hellcat. Â This was the only day we could see the entire debris field from above. It’s been a few days since I got here and things have been going at a alternating hectic and frenetic pace. Mostly. Getting my body on the right time zone is always a challenge and does interfere with getting these updates out at the beginning. So let me catch you up. 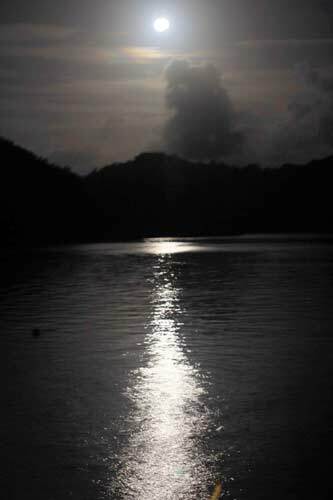 I arrived in Palau at 0100 on 22 March. Unfortunately, my checked luggage did not. That included all my scuba gear. Occasionally, passenger aircraft get weight restricted in flying long distances. Or as we say in our company, payload optimized. When that happens it means that you may not be able to take all of the cargo and bags that have been scheduled to go. 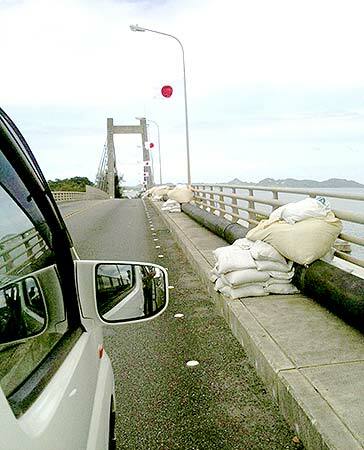 The first bags and cargo to be pulled are employee bags and company cargo. This helps protect the people who pay the bills. So when I arrived in Palau, my bags were still in Portland, Oregon. However, the next day my bags got routed via Japan and South Korea to Palau and arrived at 0145 on the 23rd. With gear in hand, I could now get wet. 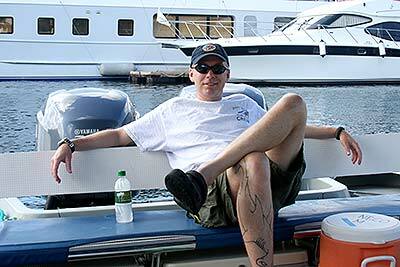 But until my gear arrived, I did boat duties. And our task was pretty simple. Close out the crash site that had been discovered at the beginning of the trip. 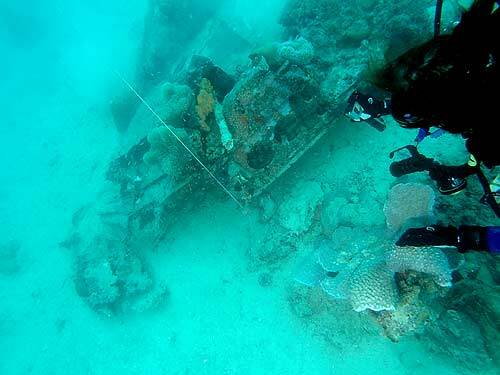 We can now say that the aircraft we found is an SB2C Helldiver. File photos: what an SB2C Helldiver looks like BEFORE it’s shot down. 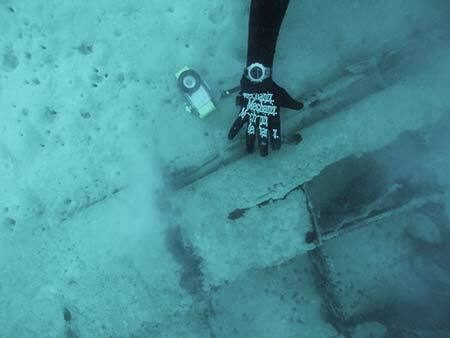 Sorry – we don’t have underwater crash-site photos to share. 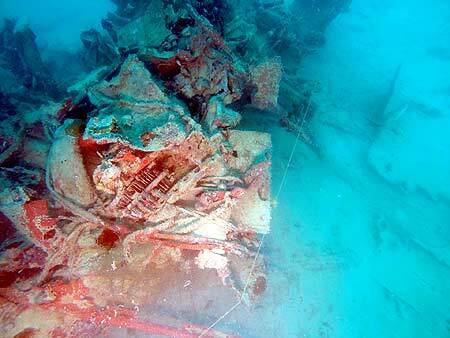 The Helldiver had a crew of two and this crew has been MIA for 70 years. We’ve done as much work on the site as we can to make this determination, so no further investigations by us are necessary. It’s time to write the reports and turn over the information to DPAA (Defense POW/MIA Accounting Agency, formerly JPAC). These are the people who, if they ultimately decide to commit resources, will conduct an actual recovery effort for the crew. 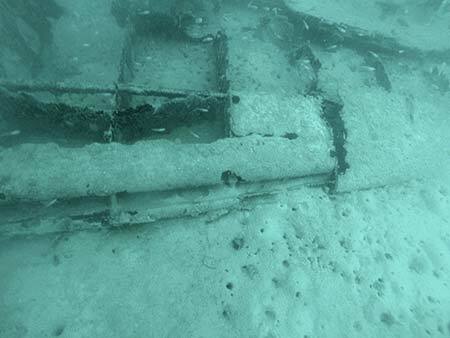 This find is a direct result of the cooperation between BentProp, the University of Delaware, College of Earth, Ocean, and Environment, and Scripps Institution of Oceanography. We met out in San Diego for a joint planning session in January. We reviewed reports, previous data and photos and came up with search plans in defined areas of the harbors. 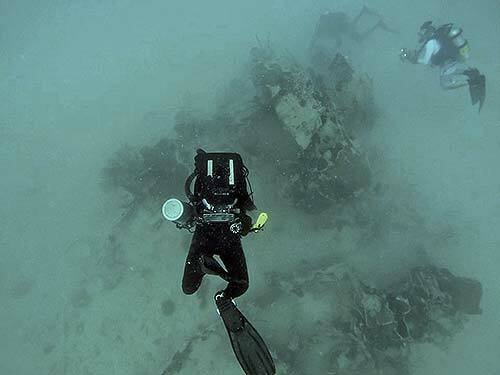 Once in country, and on one of the first days of operations, one of the REMUS underwater vehicles imaged the wreckage in 110 feet of water and over the course of a few days, divers from all three organizations made the determination that it is a Helldiver. 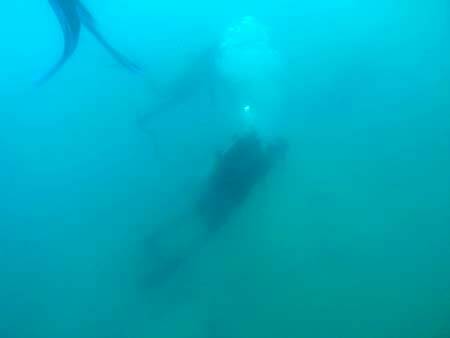 The close-out was just a group of four divers who went down to take one last look at the site, take a few photos and remove our submerged buoy. When we headed back to shore for lunch, it was obvious everyone needed to get some rest. They had been working hard for the past week, so an easy afternoon was in order. For lunch, almost everyone ordered the Tsunami burger, which is ginormous, so most just snacked around dinner time. As far as I’m concerned, that is just crazy talk. A grocery run was made and folks did a bunch of admin tasks, then we went out to the Palau Pacific Resort (PPR) for sunset and finally headed back to the hotel for debriefing. Last year we did debriefs almost every night with Scripps and UDEL that lasted way into the night. Mostly because we did it after the sun had set, and after dinner. Using the smart-person theorem, we have adjusted to having these group debriefs every other night, or when really needed, but we do it as a working dinner. It really saves time and gets people to bed at a reasonable hour. Although the dinner portion was skipped tonight, the debrief happened and it was an efficient use of our time. We were given a set of targets to go dive that were developed by Scripps and UDEL. We were up early and had our first bacon-and-egg breakfast. When the team arrived on 13 March, the island was out of a lot of normal groceries. There were no fruits, veggies, eggs or bacon to be had. However, the grocery boat came in yesterday and we replenished our pantry. We had a set of targets to explore in a small lagoon. 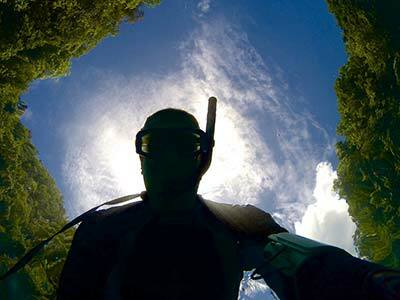 Although we had searched this lagoon years ago, we only used our eyeballs and the help of a local expat diver Dennis. He knew where there were some things and he showed us. 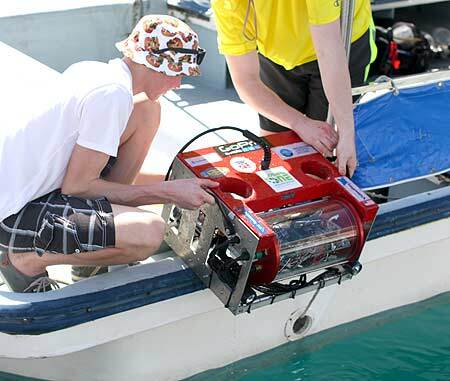 This year, the AUV searched and came up with a lot of interesting looking things. Unfortunately, all the interesting things that were parts of aircraft were things we had seen before, and all the new items were rocks. 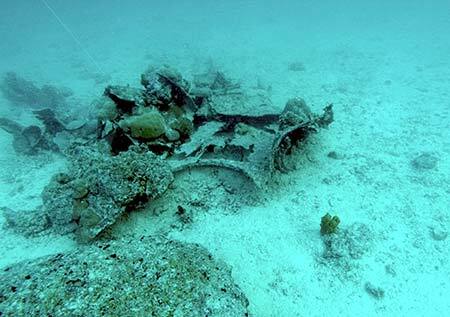 Take a look at our old mission reports from 2004 through 2006 and you can see more photos of this TBM Avenger debris. 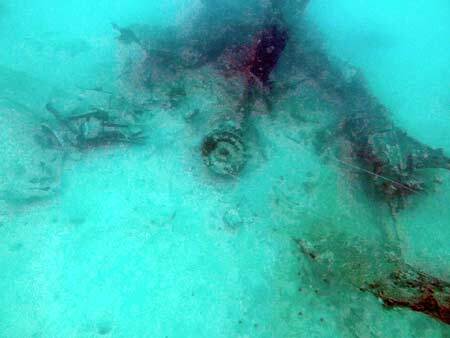 The good news is that none of the parts in this lagoon belong to the Helldiver. 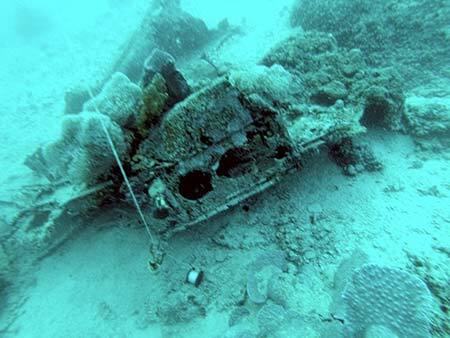 So we still have the rest of another airplane, an Avenger, to be found. Between BentProp, Scripps and UDEL, we blasted through our target list by lunchtime. So some folks went to town to take care of some admin business (this admin stuff is never ending) and the rest of us went around Ngargol Island. We were scouting places that might allow an easier climb onto the island. 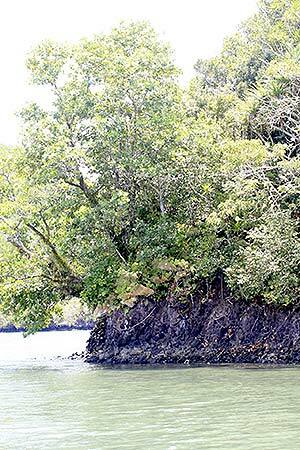 These little rock islands are treacherously steep, so easy – or easier – are really relative terms. The island we think is under the flight path of the Avenger, some of whose parts are in that little lagoon. We also found some Avenger-related debris up on top of the island a few years ago and we want to take another look on the opposite side from where we’ve already searched. 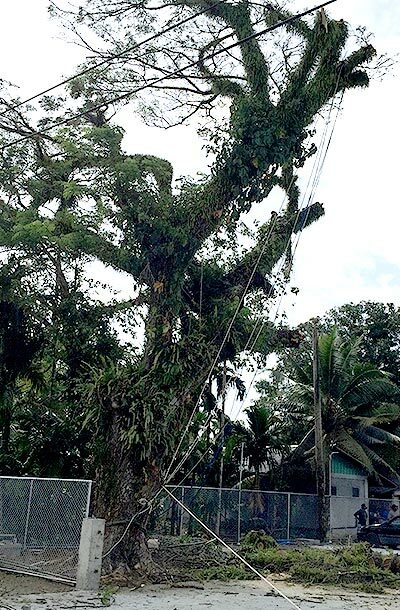 A local has reported some more debris up there. We found a few spots that might make the entry point doable. Derek will be leading that effort on the island. 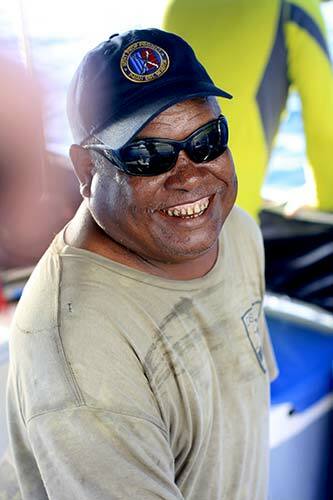 Tomorrow, we’ll be assisted by a Palauan who knows where an aircraft engine is in a place we’ve never been. 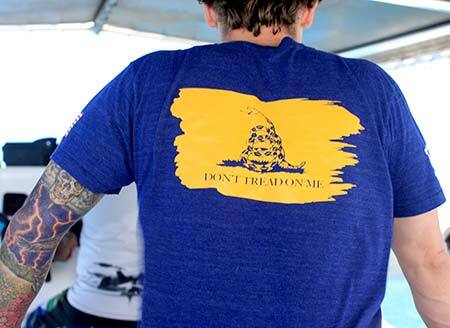 It’s down south and a boat ride will be necessary. He says it’s in 5-20 feet of water. We should be able to see it from the surface. And he’s willing to show us where it is. That’s a good thing. The odds are better when someone actually takes us there. But that is tomorrow. Although we had a pretty boat ride going to and from the “engine” area, we couldn’t locate the item. This is not unusual. When a local takes us out to a spot, the odds are better that we’ll find something, but that is not guaranteed. He said he would look for it on his own and get back with us. 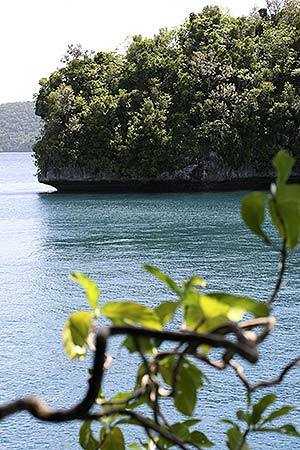 So here are some photos of Palau. Amazing Blue Waters of Palau. Can’t find water like this back home. We had a couple of good strategy sessions on how to prosecute more likely targets and have developed a plan to attack each of our cases in an orderly manner. Lovely dinner at The Taj, a great Indian restaurant. Split ops. More and more pieces of the Avenger. 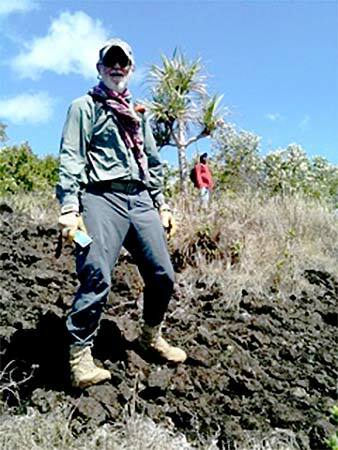 Derek led a team up onto a small rock island , Derek’s Island, near where we have been finding Avenger parts. Joining him were Blake, Mickaila, Joe and newest team member, Dan Friedkin. They let in on the western side of the island and hiked east. 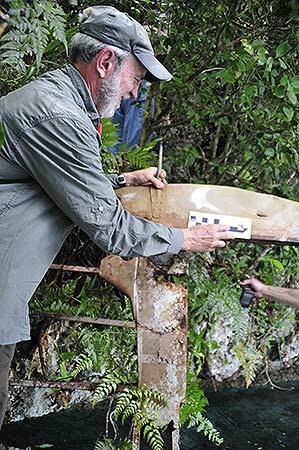 They found a piece high up on the island and when they turned around and hiked lower down the slope, found the rest of the rudder. And it is an Avenger rudder. 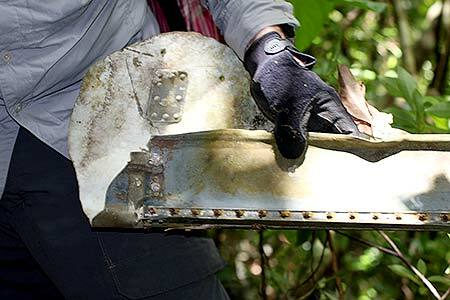 The good news is so far, we’ve only found one iteration of an item in and around all these parts we’ve found over the years: one rudder, one right wing, etc. If we found two items, that would mean we have two crash cases intermingled. So far, we’re just looking at one. We only had one boat so after we were let out in the lagoon, the boat dropped Derek and team off on the island. Then the boat shuttled back and forth keeping tabs on both groups. 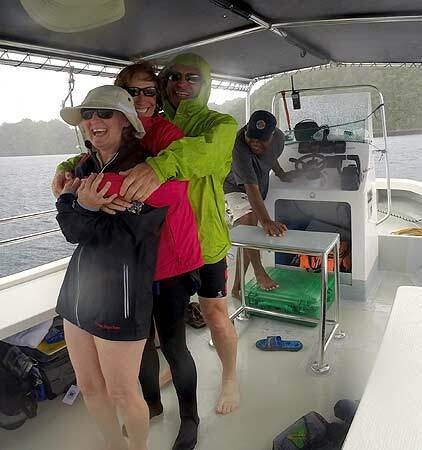 After the snorkel survey was complete, the water folks were picked up, left the little lagoon and as we approached the island where Derek’s team was working, we could hear them excitedly telling us about the rudder find. 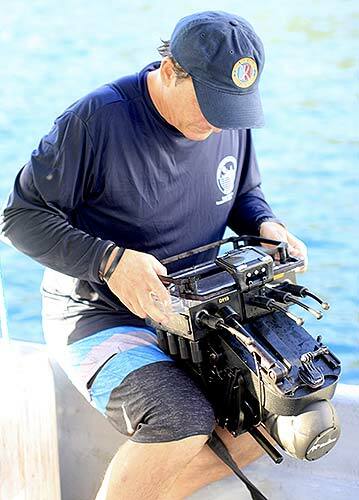 While the land team continued to work, Val and I donned our scuba gear and dropped on a couple of side scan sonar (sss) targets Scripps and UDEL developed. We went down to about 80 feet and found a big rock and two tires. Swimming along the bottom on a heading to find the second target didn’t help either. 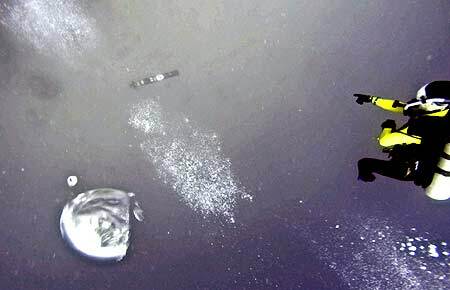 After another dive down, we found a different rock in the second target area. Along with some more tires. Back to port to drop off some of our folks and after lunch, back out to scuba the lagoon and some more targets in the water in the vicinity of where the rudder was found. Blake, Derek and I did the tea cup bottom of the small lagoon: once lengthwise through the middle and deepest part and then back and forth many time across the shorter direction, shifting south after each transit. We did find a â€˜propulsion unit’ of sorts, but other than that, nothing of import. This is an abandoned ship in Malakal Harbor. It comes from China. It was supposed to be turned into a luxury hotel. It’s a river cruiser, flat bottomed and unpainted. And the work will never be done on it. The water folks did a combination of scuba and snorkel. The underwater vehicles have done a lot of searching, but they can’t get close to the islands. So there are void areas and that is where we were tasked to search today. 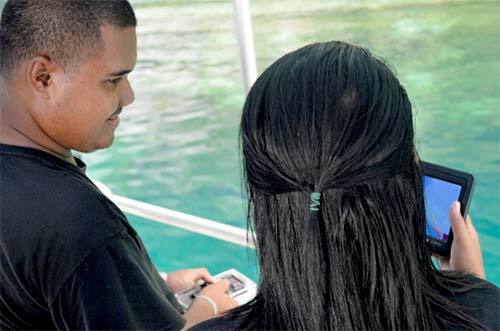 The snorkelers went on the surface and looked at the subsurface of the island walls. 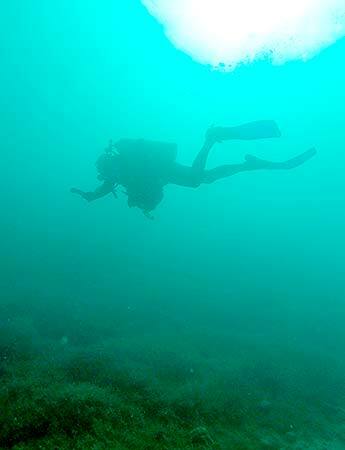 The scuba folks looked at the area where the vertical rock walls meet the sandy ocean bottom. No pertinent parts were found. All dives. All day. The land folks hiked a spit of land on one of the rock islands. Guidroz Island to be precise.The thought is that this island lies perpendicular to the attack flight path of the missing Avenger. Maybe some parts, or the fuselage, landed here. We hiked on both sides of the island and the top and it was aircraft-aluminum-free. 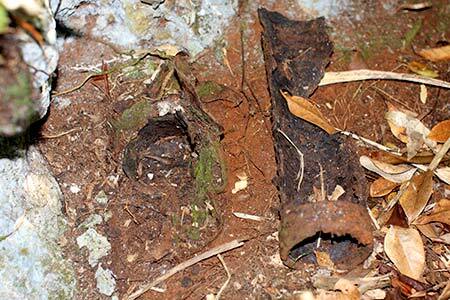 We did find a couple of tubes sticking out of the ground that look like vent tubes for a cave system. A bit later, we found an entrance to a cave – one that you could stand in. However, it was fairly isolated and it was at least 10 feet to the floor of the cave and we did not have a ladder with us. And the odds are that no airplanes are in there. So we pressed on. Another bittersweet flag ceremony; sea, air, and land ops. Got together with Eric and Mark from Scripps and UDEL and strategized about where to look next with respect to the Avenger pieces we’ve found so far. They use their technological search solutions where appropriate and we snorkel and scuba where the voids are in the water. Voids being places the underwater vehicles might not see: up close to reef/island walls. We also hike up on the rock islands. Derek’s San Diego State University students were supposed to arrive tonight. However, as happens every so often, their flight from Hawaii to Guam got in late and the Palau flight was not held for them. Now they have a day to play/explore in Guam. Today was a solemn, and joyous day. 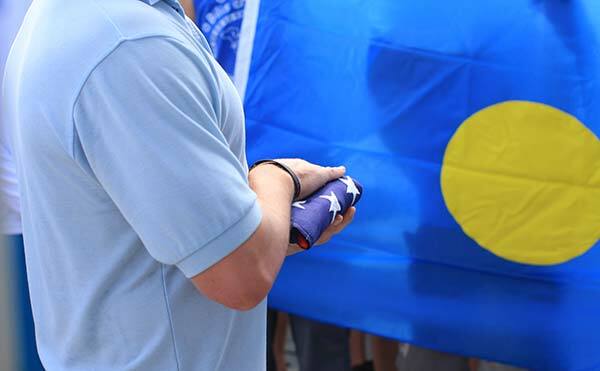 Solemn in that we held a flag ceremony in honor of the missing crew of the Helldiver we found. Joyous in that it commemorates the start of their journey home. 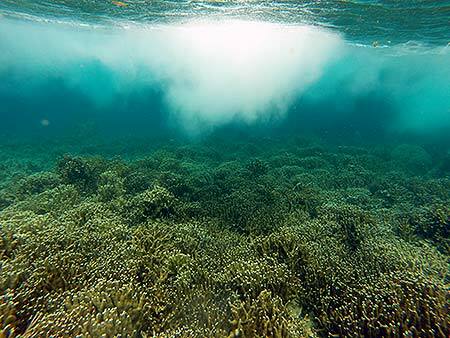 All the teams that had a hand in making this happen participated: Scripps Institution of Oceanography, University of Delaware, Coral Reef Research Foundation and The BentProp Project. 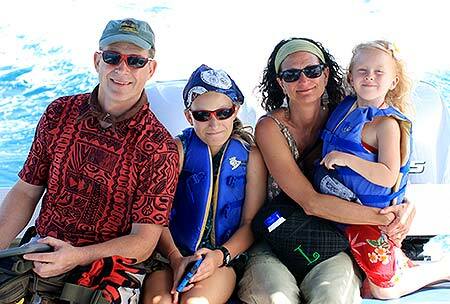 We also had a few guests aboard, Ted Mikita and his family: wife Lucretia and children Tullula and Waverly. 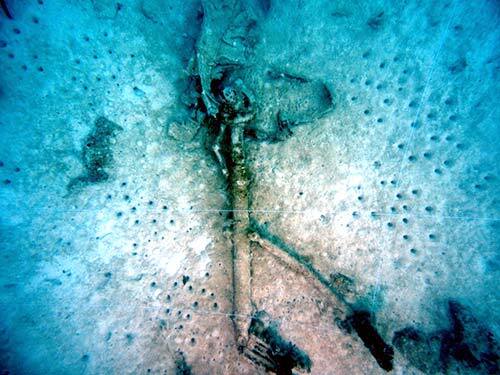 Ted’s cousin was shot down in a B-24 in Palau. 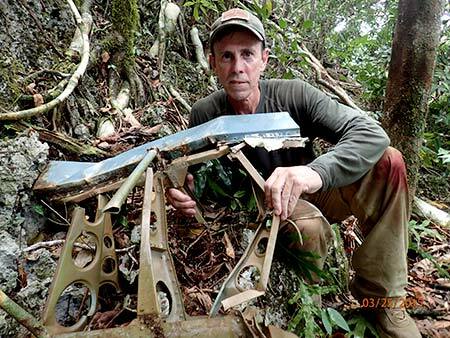 Pat had found the airplane, which is in pieces scattered around Koror, and has been telling Ted about it for the past year. Ted came out to see the airplane and try to find more pieces of it. We hold these flag ceremonies for a number of reasons. First, to honor the fallen crewmen once we find their airplane. We do it to commemorate the start of their journey home and for the families of the crewmen who are alive today. 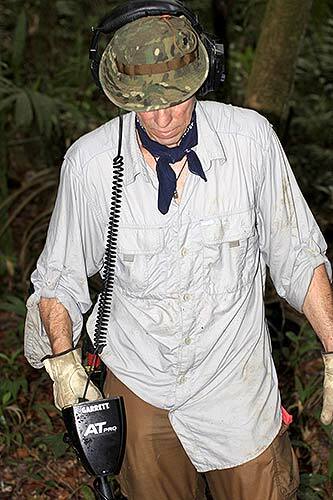 Our job the research, search, discovery, and documentation of the MIA crash site. 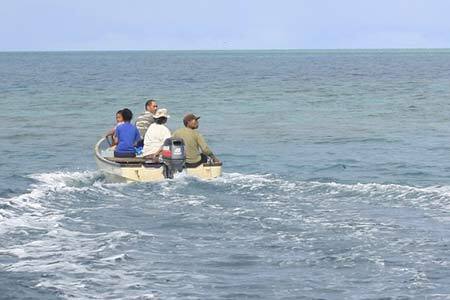 We don’t know when the U.S. Government will be able to do the recovery and identifications of the crewmen. And that has to happen prior to notification of the families. But when all that happens, the families will get a flag, a copy of the video of the ceremony, and then we’ll be happy to answer any questions they may have. 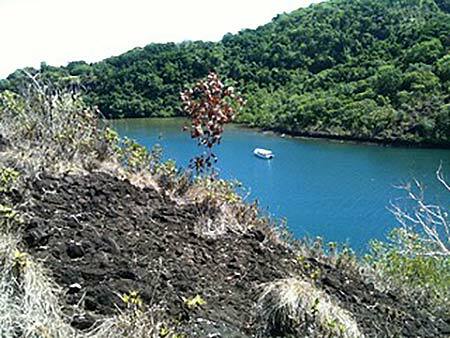 If you look back at the previous report, you’ll see two photos of two small rock islands. We climbed them both just to make sure no airplane parts were up there. Scripps, UDEL and BentProp got together for a celebratory dinner at The Taj. Great food and a good time with people who all get why it’s worth it to expend this level of effort. 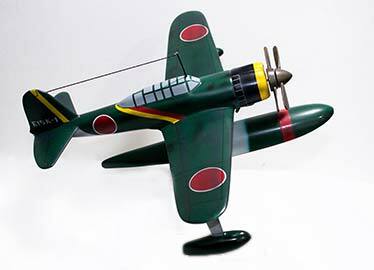 Since we found the Helldiver, it’s kinda been non-stop action for us. However, Pat does need to submit a proper site survey form to DPAA. Today he took the time to do it. Dan reviewed hours of video that Scripps and UDEL have captured. 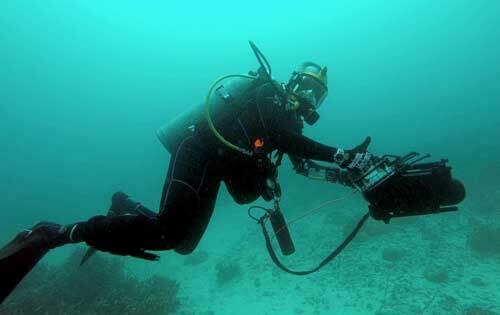 Their underwater vehicles have a number of sensors that can be used to image the ocean bottom. 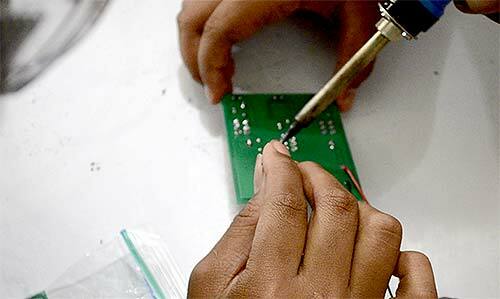 But no matter what sensor is used, someone has to look at the output. Today, it was Dan. I don’t think he saw anything actionable. 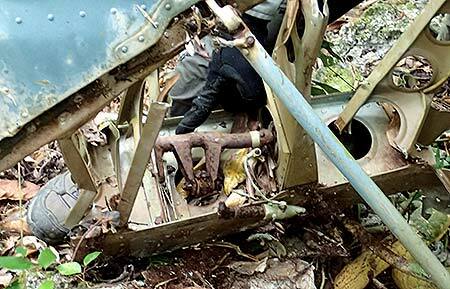 The newly uncovered wreckage. 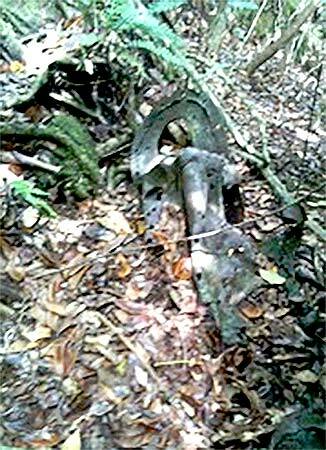 It appears to be a Japanese aircraft wing, maybe a Betty bomber. Photo by Val. 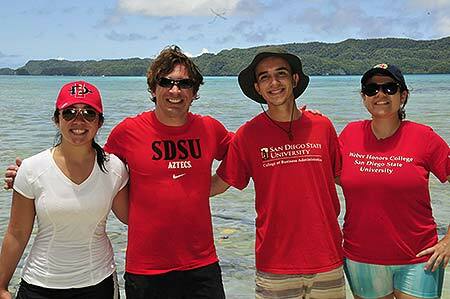 Happy SDSU students, Jade, Jake and Olivia with their faculty facilitator Derek. And on their first day they helped find something new! Blake and I helped Jolie Liston do some archaeological work. We suspect some airmen, UDT frogmen, Jesuit missionaries and a local family were all executed in an area we call Police Hill. If you’ve been following our story over the years, you may remember that Mark Swank established a hypothesis that if we went to the bridge over a river with railroad tracks in it, went a bit this way to an air raid shelter, went up the hill to the ridge road, went down the road to the edge of the forest, we would find an ammunition depot. They were executed near there, then dug up, cremated and then transferred to a different piece of jungle and buried in an “L” shaped trench. 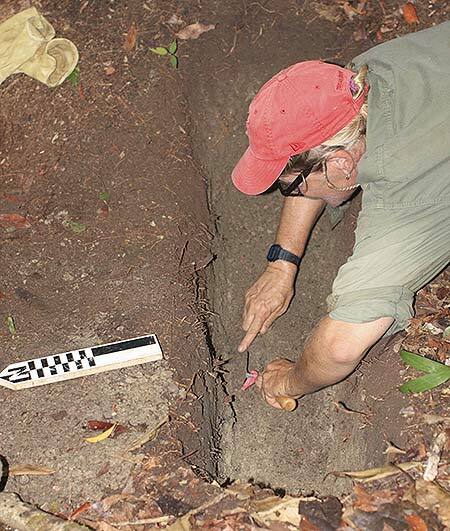 A few years ago, we followed this bread crumb trail and found an L-shaped trench. 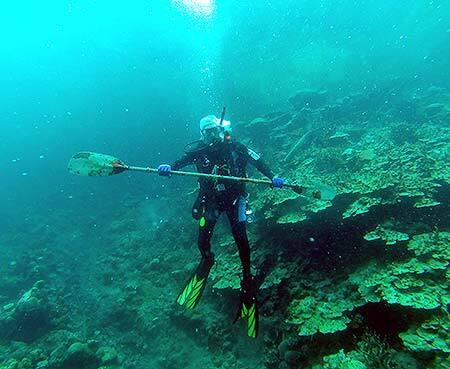 To dig in Palau on a site like this, you need a professional. And that is what Jolie is, a professional archaeologist. With Blake and me helping her, she cut a test trench perpendicular to the L-shaped trench. This was to take a look into the trench and see if she could tell if it had been dug before. She could not see any evidence of prior digging. 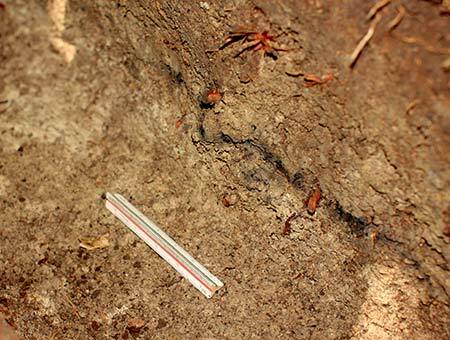 But down close to the clay layer, was a burnt layer of charcoal. This was totally unexpected. We don’t exactly know what this means, but it appears something was burned here. It might be nature, it might be man. She collected some soil samples and we’re going to have them tested. The last BentProp member for this year was supposed to show up at 8 p.m. tonight. Warren Bruce, active duty Marine, will be getting in sometime after midnight. The airplane he’s scheduled on needed some maintenance and it’s going to delay Warren’s arrival. But he already has an email telling him to be prepared for a 0700 brief for the day’s festivities. Sleep fast, Warren! Blake leaves; Warren arrives; more Avenger pieces! And the really great news is we found some more of that Avenger we’ve been looking for. 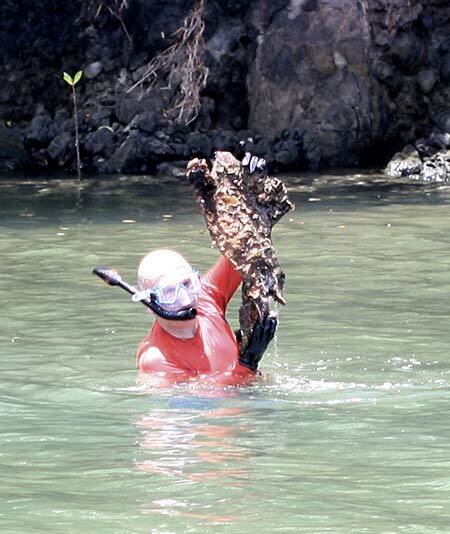 The bread crumb trail has lead us into the main harbor of Palau and we finally found a chunk of it. Not enough to make an airplane, but a good sized portion of the aft fuselage, around the bomb bay area. 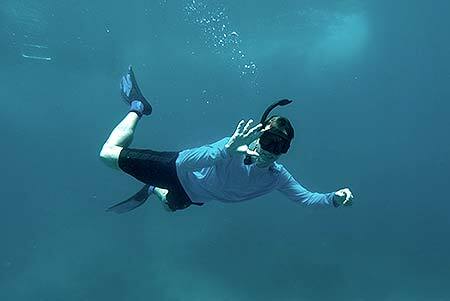 Blake couldn’t dive on his last day, but no reason he couldn’t snorkel. The newest piece of the Avenger. 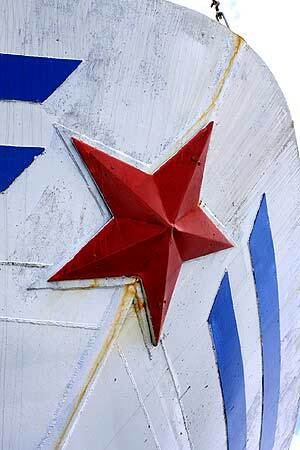 We’ve been finding pieces of this Avenger for YEARS. 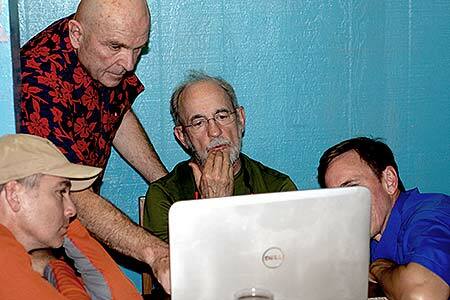 In addition, Dan stayed behind today to review video of the harbor bottom that the AUVs took on their missions. He had a lot of video to review. But he did get lucky in that he saw a quick flash of a wheel with some debris around it. Our hope is it is an Avenger wheel. But you’ll have to wait until tomorrow to find out. 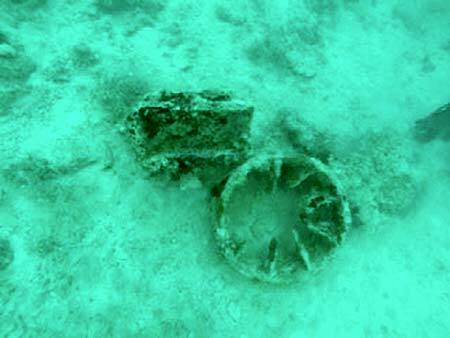 We did dive on that wheel and it is not an aviation wheel at all. 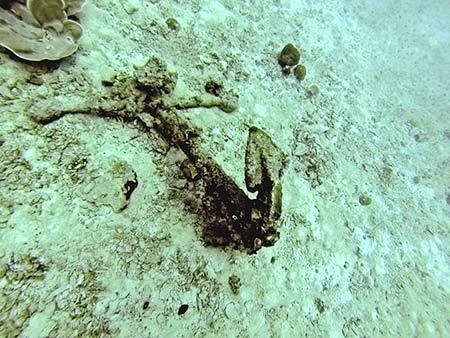 There’s lots of ship debris in the water and this may be some of it. Or not. But it is not what we are looking for. This is a short update. We do have some interesting looking targets for tomorrow. Hopefully, we’ll find some more of the airplane. P.S. The typhoon is passing far north of us. Some folks say we’re going to get rain and 35 knots of wind. Others say it’s just going to be a beautiful day. Some sort of rain storm just started as I was finishing this up. We’re well prepared for a storm: water, cash, movies and popcorn. No typhoon; no fruit bats. First off, the typhoon. I know that everyone with loved ones out here has concerns for our well-being, considering the typhoon was reported to be near by. Well, my air conditioner last night had more velocity than the wind did today. I heard rain last night for 15 minutes while I finished the last update and I saw rain today for 30 seconds. We had a marvelous day out on the water. 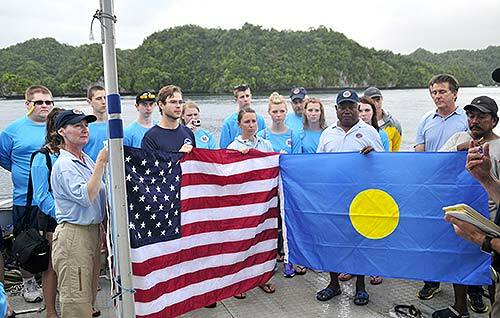 At 0100 this morning, the Stockbridge High School Advanced Underwater Robotics Team arrived in Palau. We met up with them in the morning and found out the students had already put their underwater vehicle together and had flown the airborne drone as well. Today was going to be a shakedown cruise for their bots and a chance to get adjusted to this time zone. Tomorrow, we’ll have them start really utilizing their robot looking for stuff. As for us, we’ve found a lot more places where this Avenger isn’t. 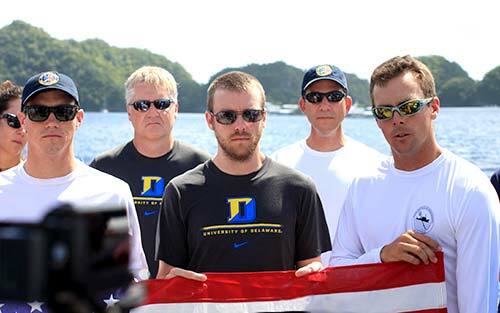 We had planned on diving on four specific targets that the AUVs’ Side-Scan Sonar (SSS) found. 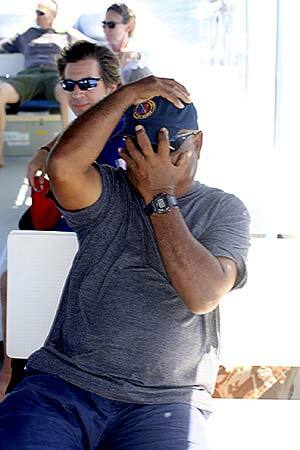 All four dives were to 100 feet out in the middle of Malakal Harbor. 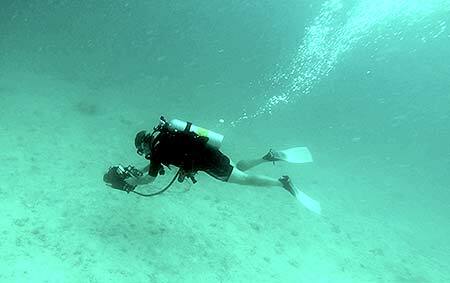 The first group of divers went in on the lGPS coordinates and found nothing on the ocean bottom except for bad visibility. We decided we needed a little help so we called for an Alien Finder if it was available. As it turned out, one was and we went back and picked up Mark from UDEL and Myles from Scripps. They helped us prosecute the other targets. but Mark has a PhD for a reason and knows exactly when to exhale. 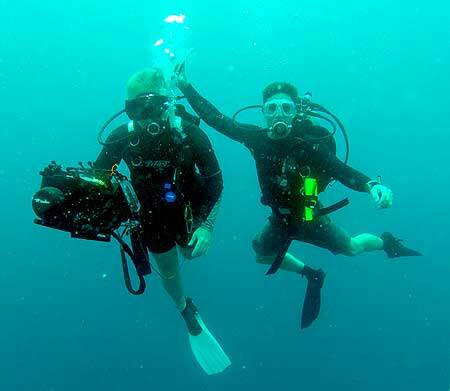 On one dive, Mark had something on the view finder but when he got close to the bottom, the visibility went to zero and her couldn’t even read his screen. They called it diving in yogurt. After another sweep of the zone where the sandy bottom meets the coral island, I did get to see one of the REMUS vehicles swim by. Pat pointing out the REMUS swimming by below us. So, after all of these attempts in the harbor, it must be someplace else. I think Sherlock Holmes had something to say about this. We met up with the Civic Action Team at the end of the day. 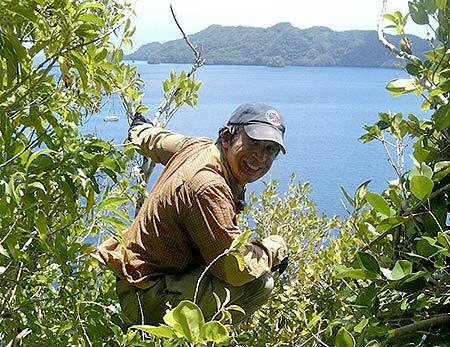 It’s an Army group this time and they are doing good works all over Palau. This used to be a Seabee-only detachment, and they were deployed all over the Pacific doing public works projects. 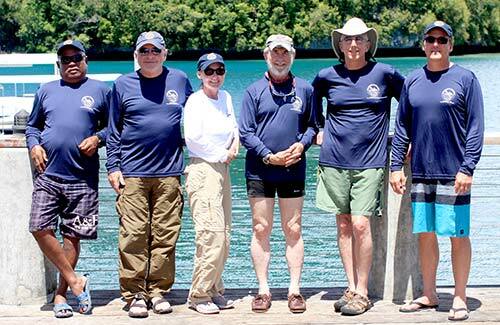 Palau is THE last CAT team location. Out to Bem Ermii for my first burger out here. Okay, maybe not my first milkshake, but my first burger anyway. Tomorrow, the Stockbridge Robotics Team takes to the water to help us search. We had split ops today. I went with the Stockbridge students, Pat went to give a lecture to a local medical clinic, Derek and the SDSU students tagged along, and everyone else went out on the boat. The boat people dove in a few more places and didn’t find a thing. 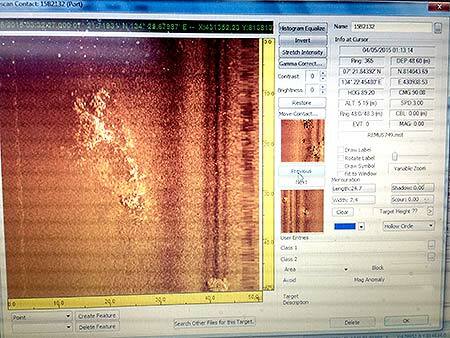 They went back to the hotel and reviewed video files that the Scripps and UDEL underwater vehicles had captured. I don’t think they found anything of interest. 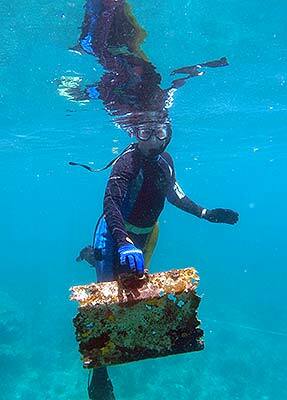 There is some junk in the harbor, but not what we’re looking for. I wasn’t at Pat’s medical presentation but I heard it was well received. I was on the boat with Stockbridge. They’re much further along on their first day than they were on their fourth day last year. They redesigned the robot, making it more robust and simpler. They even added wifi to the output options so I could see what the bot was looking at on my iPhone. No more crowding around a monitor that all of the students are trying to use. 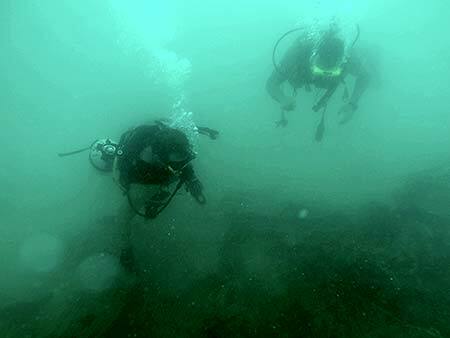 The first task that they were given was to survey the transition zone between a ship’s hull and the ocean bottom. Something could be lurking in there! 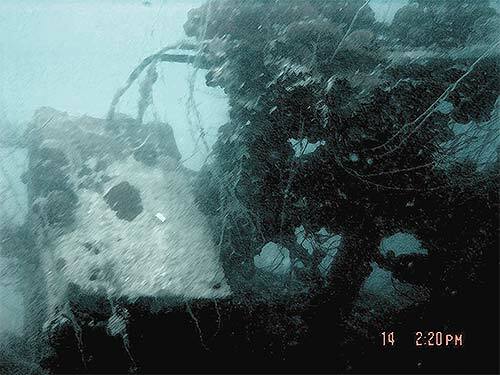 This is also a popular dive site so a buoy was attached to the ship. The students just needed to figure out how to get to it from the surface. Which they did. They circumnavigated the ship really well, after adjusting for the currents. It is different in the ocean vice a swimming pool. There’s always going to be trouble and the SHS students always fix it. A screen shot from my iPhone taken from the robot. That’s a ship in there. The next task was to look at the big Avenger part we found, and then search down slope from it looking for other piece parts. That task wasn’t so easy. The boat we were on could not drop an anchor near the part, because we don’t want to risk damaging it. There was no secure buoy on it to attach to. So the driver did the best he could in wind, waves and current to station-keep, but the little bobber we have doesn’t stay above the water at high tide so it became a problem. Although they got to the bottom and could see the slope of the island meet the sand bottom, they never got to the Avenger piece. That is a task they’ll do tomorrow. We went back to port and once the boat was secure, we held a debrief. The students really believe in moving the ball forward in this project. Each year the team has advanced and handed off to the next team to take it further. They understand that without good briefs at the beginning of the day, and debriefs at the end, they won’t get as far as they could. In the middle of the debrief, Mark Moline came up to me and said he had a new hypothesis on where the Avenger is. And it made sense! We’ll prosecute that in the days to come. But he also said that Eric, Andy, Myles and Travis from Scripps were going diving one more time and asked if I wanted to go. I said I needed to finish the debrief so I declined. But when the debrief was over, I saw Eric and crew hadn’t left. 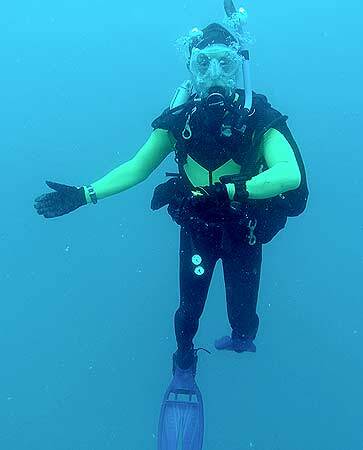 So I ran to the end of the dock, stuck my thumb out and hoped they would pick up a lonely diver. They did! 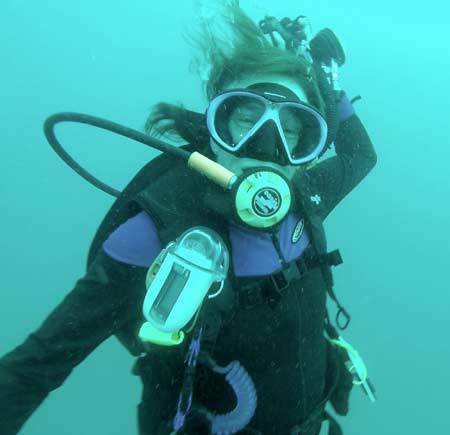 Got a dive in in really murky water, saw rocks and shapes and a big sunken buoy. I must have seen a fish but I just don’t remember. 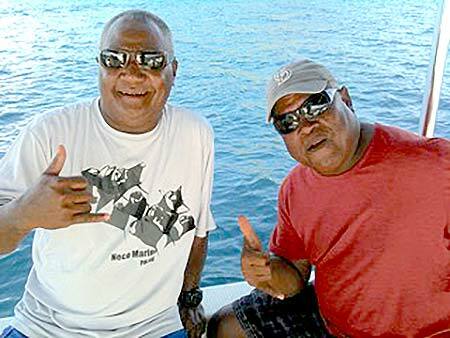 Yes, even Palau has murky waters. Back to the hotel, quick clean up and then out to Carp for dinner. 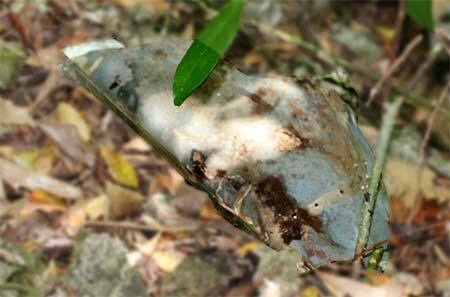 Carp serves local Palauan delicacies, and one of the tastiest is Fruit Bat Soup. Pretty much a tradition that new people have to have Fruit Bat Soup. The good news is Joe loves FBS so nothing goes to waste. However, they were fresh out of fruit bats, and the new folks couldn’t contain their glee. Time to turn in and prepare to climb sheer vertical cliffs in search of the elusive Avenger. Not exactly April Fool, but…the Avenger! Jennifer went with Stockbridge and reported that the students did everything we asked of them with their underwater ROV. 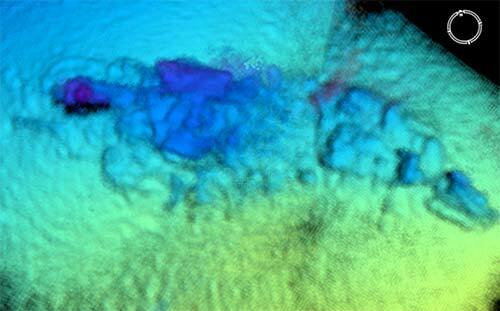 Their task today was to survey the transition between the side of a Japanese ship resting on the bottom of Western Lagoon and the ocean floor. 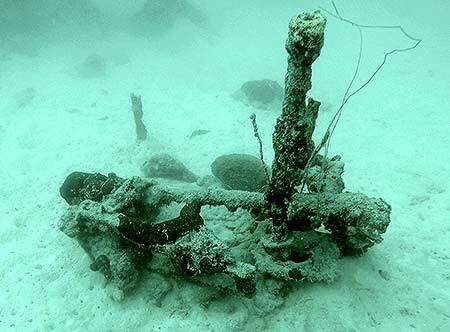 They did and discovered mooring lines, debris and some unusual parts that they took pictures of. We will analyze in a day or two to see if they are pertinent. Tomorrow, we’ll have them work a site that we are still investigating. The rest of us went back to Derek’s Island to hike the western portion of it, and to finally get on the south side that has some pretty steep cliffs. We did not find a scrap of metal anywhere. Well almost everyone went hiking. Someone had to stay and guard the boat and it was my turn to do that. 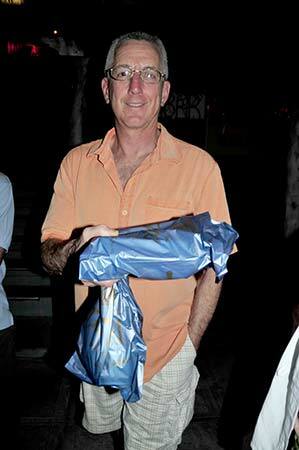 It was Warren’s last night here in Palau and he chose The Taj for his farewell dinner. He came for just a short period of time and now he’s headed back to family and work. It was great to have him out here again. We went out early today so that the tide would be in our favor for visibility. 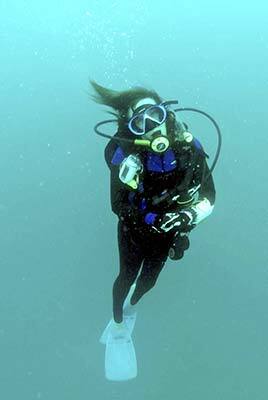 This would be my first dive on this site. We’re back on the Helldiver investigating further. 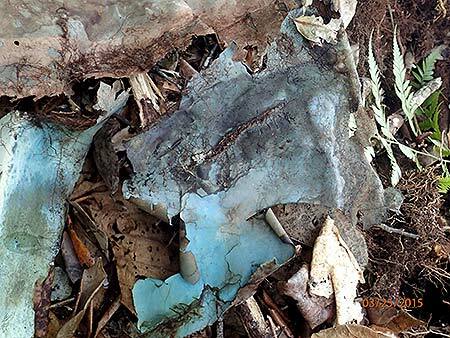 The reason is that as Pat developed his site survey form, there were inconsistencies in the debris field. 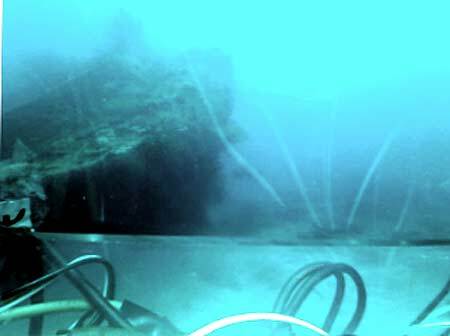 The visibility was so poor the days we worked the site on discovery, and our bottom time per dive was so short, it led us to hypothesis bias. 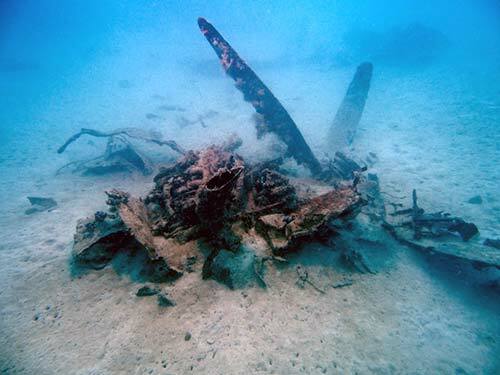 Upon further investigation, including 14 dives to 112 feet, we found all the proof we needed to determine that this airplane is an Avenger, not a Helldiver. First off, we’re a bit upset with ourselves for falling into this trap. However, there is good news in that a crew of three might be starting their journey home. As to the Helldiver, all of our analysis of the reports put it near where we found the Avenger. Obviously it’s not there. It must be someplace else. We all are redoubling our efforts to find it. And Pat is finalizing the site survey form with all of our updated data and analysis. 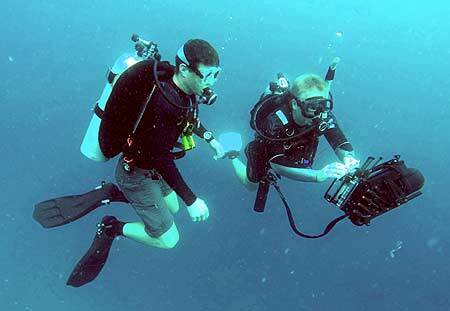 The Stockbridge Team was going to be our eyes on the Avenger today so we could save dive time. However, when they went to power up the bot prior to launching, they had power issues and the system was pulsing. They had to go back to port to effect a repair. They thought they would be back out within an hour, ready to dive. However, one problem led to another and that repair requires some epoxy to dry for 24 hours. Tomorrow, they’re heading to Peleliu for a battlefield tour before the Emperor of Japan shows up. So they’ll be back working with us on Monday. A better view of the support ship for the Emperor’s visit. 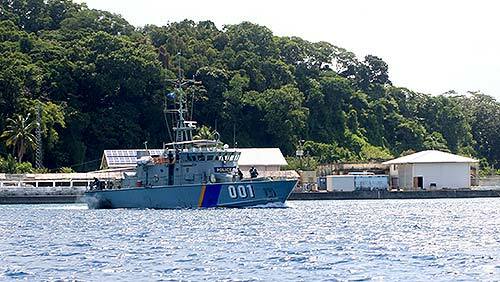 It’s been a slow couple of days in Palau. A lot of exploring and searching; not a lot of finding. Derek stayed on land on the 5th because he had to fly out that night. 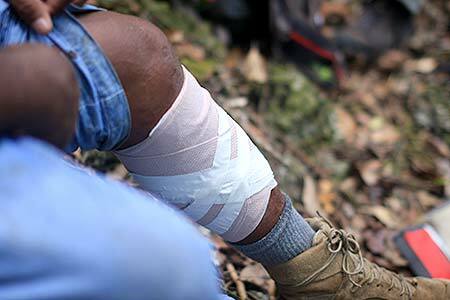 He took a contingent of the CAT (Civic Action Team) hiking with him on a hill in Malakal overlooking an area where we’re searching in the water. Although after-action reports say a couple of planes crashed in the water, there’s always a chance that they could be on land. So Derek ruled that out. We could actually see a couple of the CAT team members on the side of the hill from the boat, even though the hill is mostly jungle covered. 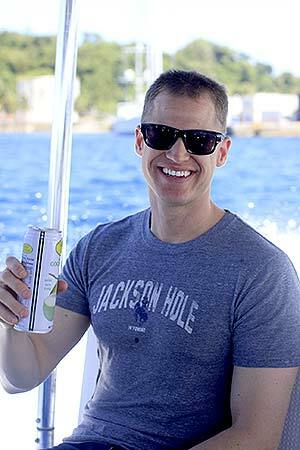 The rest of us were on the boat. 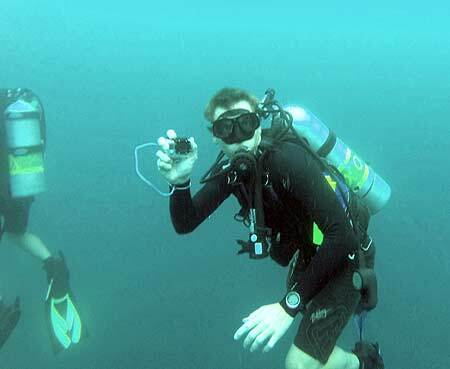 We did a bunch of dives and saw a bunch of nothing. But we did get to watch the Japan Coast Guard fly their helicopter, use their work boats and do lots of stuff in anticipation of the Emperor’s arrival. That’s just a few days from now. 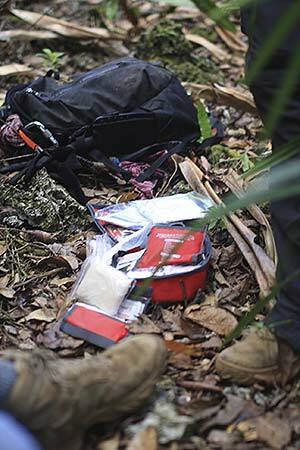 The Stockbridge team went down to Peleliu and toured the battlefields there. 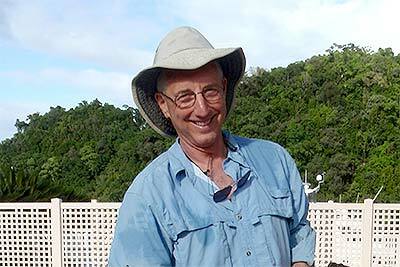 Those who had gone to Peleliu on a previous trip went diving instead. 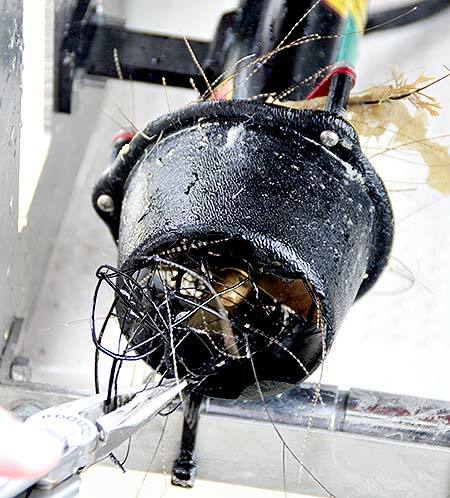 When they got back, they found their fix to the ROV hadn’t quite fixed it. So they prudently decided to take Monday the 6th off to complete repairs and start in on visiting the local schools. 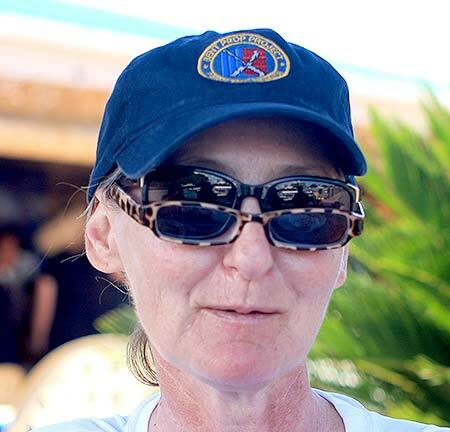 Split ops today: I stayed in to watch video from the underwater vehicles while Pat, Dan, Jennifer, Val and Mickaila went on the water. 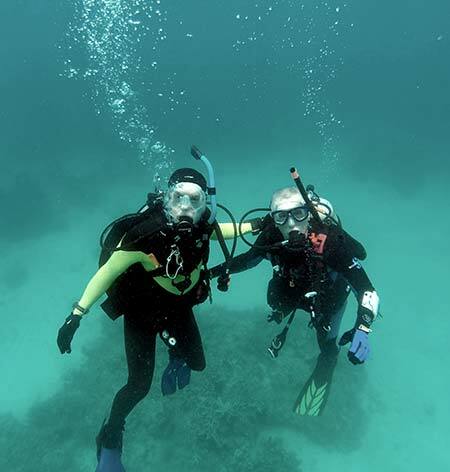 This is Val and Mickaila’s last scuba day. They fly out early on the morning of the 8th. I watched a bunch of hours of the video and found three interesting items in Malakal Harbor. 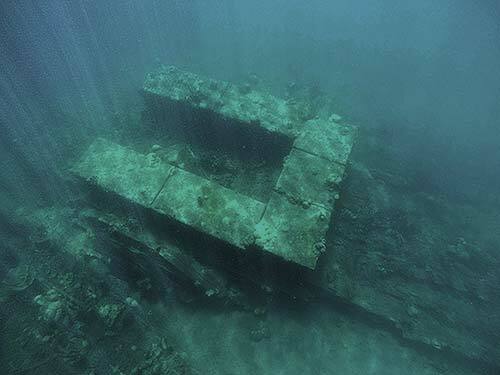 We’ll try to visit them tomorrow while diving. 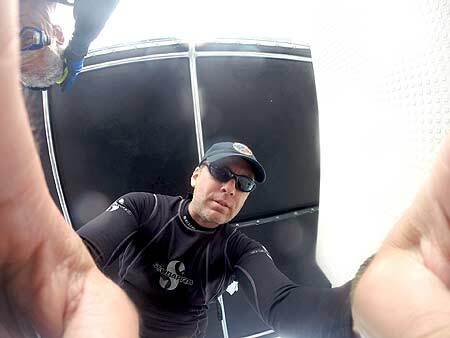 The rest of the team saw a bunch of junk at the bottom, a soon to be dead fish revived by Joe and a pod of Dugongs. A Dugong is a Palauan Manatee. 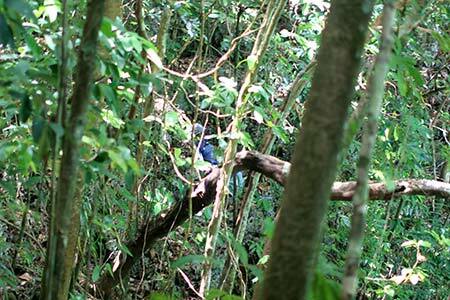 Stockbridge rocks on; a ceremony for the Avenger crew; MJ can’t dodge the fruit bats forever. 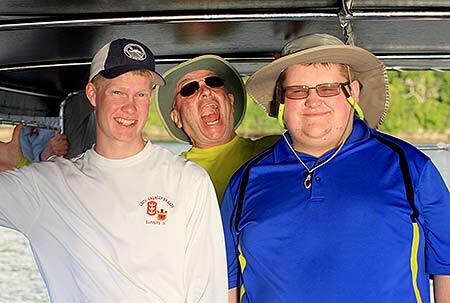 First off, the Stockbridge Students had a very successful day on the water. The repaired vehicle worked flawlessly and they scanned the ocean bottom on all the sites we gave them. Stockbridge found everything we asked for. 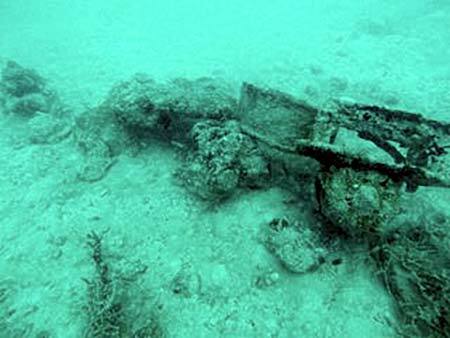 Unfortunately, nothing of airplanes, just coral and harbor junk. Val and Mickaila went with them to observe and gave glowing reports on how they showed great spirit, teamwork and execution. This is a pretty amazing story. Each year, the team builds on what went before them. They really do take in the lessons learned and improve on their performance in the field. If you remember, the first couple of years the robot leaked. They solved that. Last year the problem was navigation and searching. Within the confines of their budget, they fixed that. 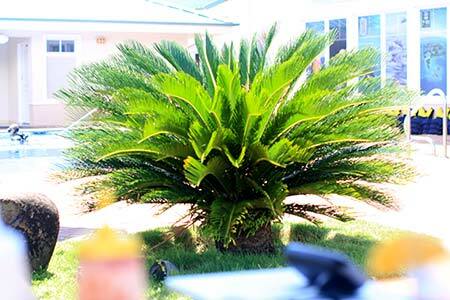 Those efforts over past years are paying off in this year’s mission. 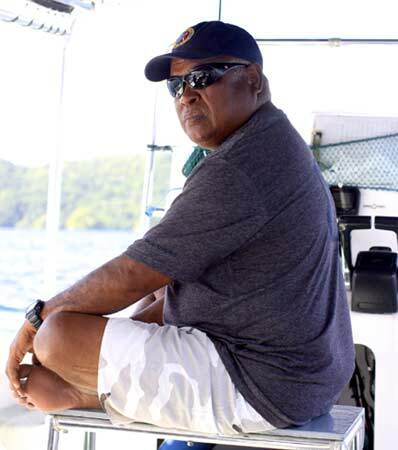 Next year, Stockbridge will be taking a year off from deploying to Palau. 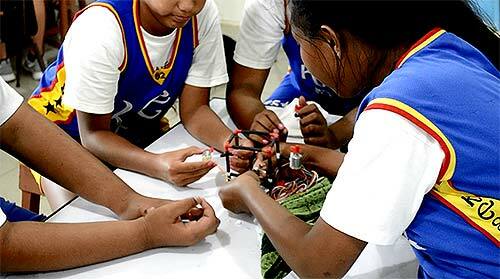 The goal is to return in 2017 and do a joint mission with the robotics students from the Palau Community College. 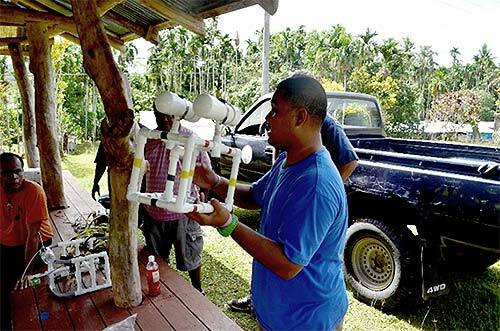 Over the course of the next two years, both groups will be building robots concurrently, communicating back and forth between the U.S. and Palau for mutual success. To keep up with this emerging story, stay connected with Stockbridge via their Facebook site. We visited the U.S. Ambassador, The Honorable Pam Hyatt. She’s new to this posting and is settling in nicely in Palau. She heard about us before she got here but we got to fill in some of the unknowns about what we do out in Palau and in preparation for coming to Palau. In anticipation of the Emperor’s visit. Japan built The Friendship Bridge. 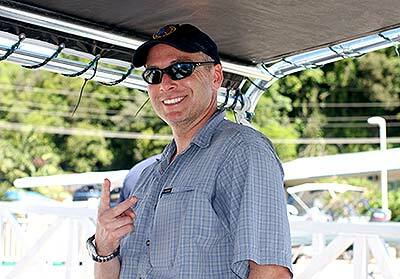 Dan Friedkin returned to Palau to join in the search with us. 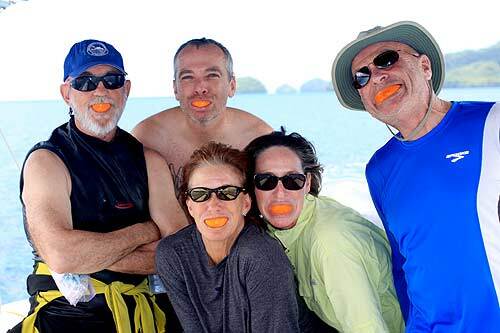 On the boat today was Joe, Pat, Dan O’Brien, Jennifer, Flip, and Dan Friedkin. 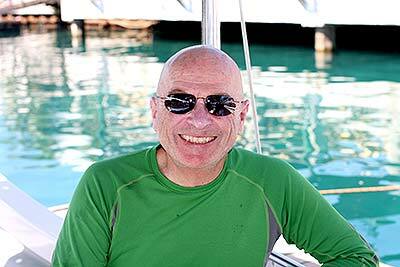 We’ve had great weather in Palau this year. Very little rain during the work days. Until today, when we had off-and-on rain showers. But since we were getting wet anyway…. We had four specific targets to drop in on today. Dan Friedkin was using The Navigator and I ‘flew’ his wing. We dropped in on two different targets: one was a re-acquire from a previous dive that UDEL and SIO really liked, and one was from a video review that looked like part of an instrument panel stuck in some coral. We found them both and they turned out to be coral outcroppings. Dan O’Brien and Pat dropped in on two targets. 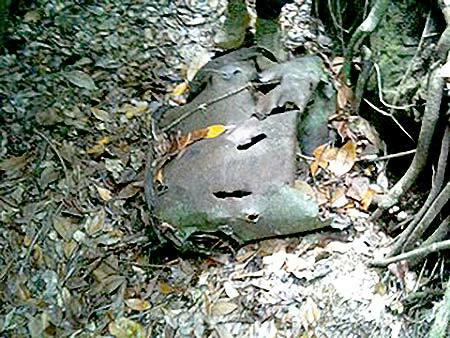 On video, one looked like a propeller blade sticking up out of the bottom and the other looked like a metal structure with some biological growth on it. 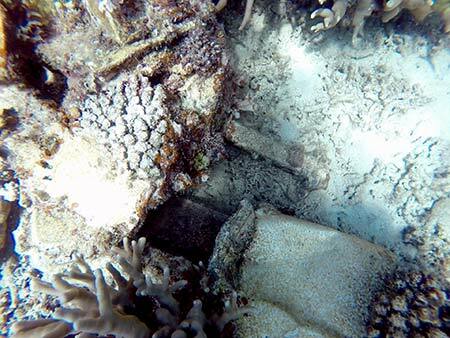 Both turned out to be — you guessed it — coral outcroppings and some discolored sand. We headed back to port early having another ceremony to do. When we discovered that we had made a premature mis-identification of the Avenger, we realized that we had not yet done a proper flag ceremony for the Avenger crew. The Helldiver had a crew of two and the Avenger had a crew of three. 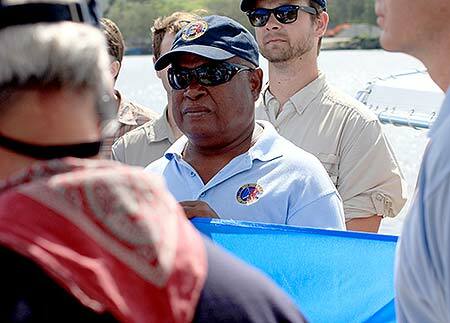 Since the recorded ceremonies and flags are to be given to families, we still needed one for the entire Avenger crew. 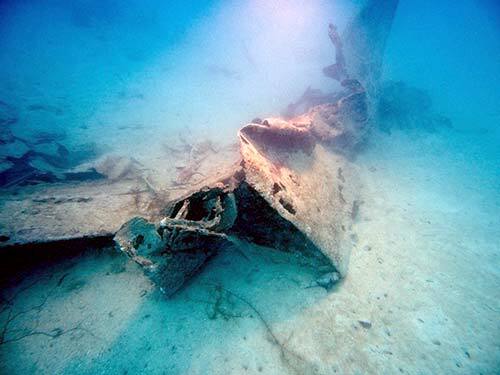 So the ceremony we did for the Helldiver, we’ll hold onto until we find the Helldiver. 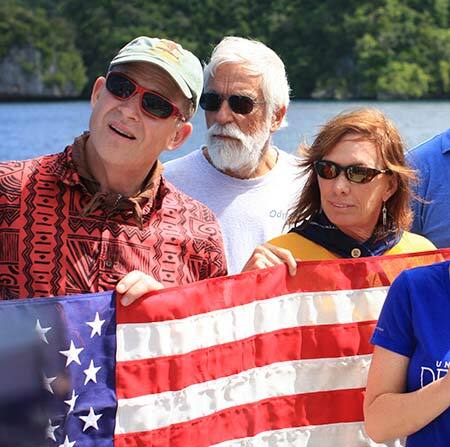 For the Avenger crew, the remaining BentProppers, UDEL, Scripps and all of Stockbridge boarded the Kemedukl (The Coral Reef Research Foundation’s workboat) with Pat and Lori Colin and Matt, one of their boat captains. The rain held off until the end and we acknowledged the start of this Avenger crew’s return home. Once the recovery, identifications and notifications to the families are made by DPAA, we’ll give the families the video of the ceremony and flags and answer any questions they may have for us. Out to a new Thai restaurant for dinner. It seems the former chef of a local Thai restaurant opened her own place called Passion Thai. Very small dining area. There were eight of us and that filled the place up. She even turned customers away while we were there. It seemed we were eating in her living room rather than a restaurant. The food was great! Even the fruit bat soup. And yes, there’s a story here. Fruit Bat soup is a delicacy here and a rite of passage for new BentProppers. We went to Carp Restaurant one night so Mickaila and others could enjoy this local dish. But they had run out. Mickaila couldn’t contain his delight. Every night thereafter, because he knew the odds were infinitesimally small, no matter what restaurant, he would ask for Fruit Bat soup and feign disappointment at hearing they didn’t have it. So his friends set him up. We asked this Thai restaurant to get one order of Fruit Bat soup for him as a surprise. And was he! He put his game face on, tried it, and Joe, as usual, got a tasty extra to his dinner plate. Today was another day on the water for everyone. Dan O’Brien went with the Stockbridge team. They had another great day. This was the first time that they ran out of battery power. The robot worked so well and they imaged so much that they ran out of juice. And they found metal! But it turned out to be a ship on the bottom of the ocean. The BentProp nest gets emptier, but DPAA is ready to rock. Well, we’re quite the empty nesters now. 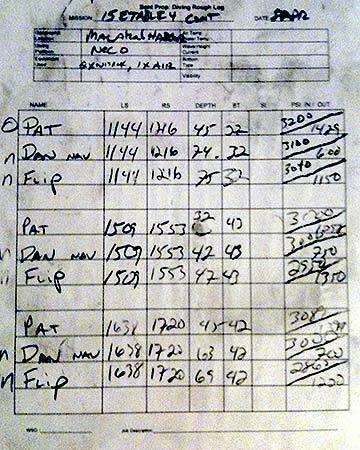 BentProp is down to Joe, Pat, DOB, Jennifer and Flip. 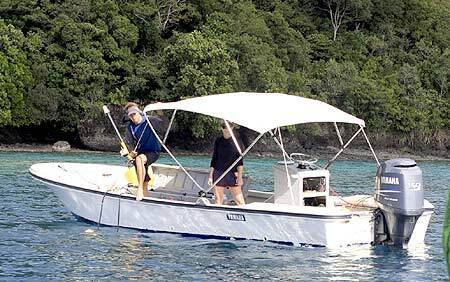 Dan Friedkin left yesterday afternoon after three days of using the Navigator to view sandy bottom, coral patches, basalt rock and not much else. With the Navigator, we did area searches, and looking at two points that were 100 meters apart. Once on the first target, with the Navigator we could swim out on a heading, pick up the next target. We have returned to our roots. No technology, no swarms of folks. Just a few people searching. 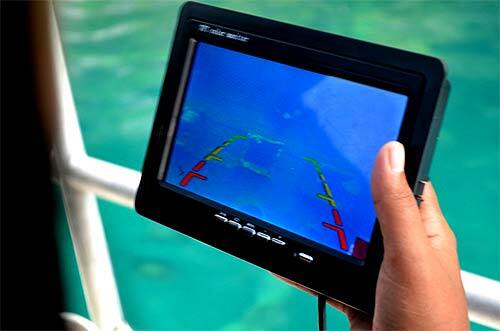 We’ve searched with our eyeballs transition zones between the coral island walls and the ocean bottom in case anything is hiding in there, like the Hellcat we found last year. We did see a ship, some boat steering linkages, fish farm boxes and not much else. DPAA (Defense POW/MIA Accounting Agency) showed up the night of the 10th. This is the official organization that will do the recoveries of the aircraft crash sites and if there are remains, bring them home. Then they will attempt to identify the individuals and return them to their families. Today, the 11th, we showed them around the new Avenger crash site we found. Tomorrow, the 12th, Pat will show them last year’s sites: the Hellcat and another Avenger. 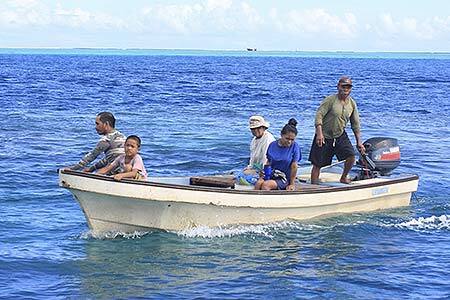 While Pat is doing that, DOB, Jennifer and I will travel with Joe up north a little ways and meet up with a Palauan who knows where an airplane is. You might remember last year, on our last day, Charlie’s cousin took us out to where he found an airplane. However, he could not find it that day. Well, he’s willing to try again and we’re willing to go with him. Tonight we had a farewell dinner with the Stockbridge students. They fly out at 0430 tomorrow. They’re a great group of kids, doing great things. And a great couple of teachers who are really helping these students have a foundation for a stellar future. 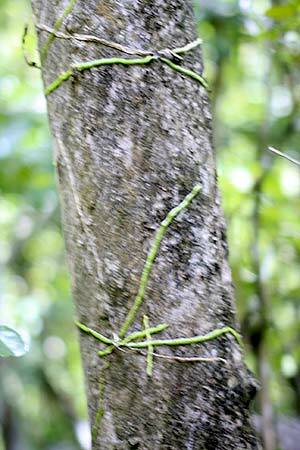 Tomorrow we’ll be working with DPAA and with a Palauan who has a sighting report. Should be interesting if everything pans out. More dives. More fish. More coral. More no parts. Winding down. I was just a little sleepy when I sent the last report and left out a couple of fun facts. 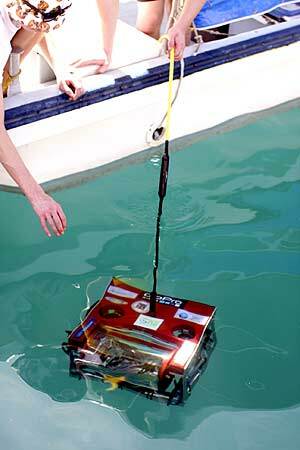 The Stockbridge Team dove their ROV down to 189 feet successfully! They have an event coming up in Michigan where they will have to get down to over 200 feet. They feel their bot can go to 300 feet. 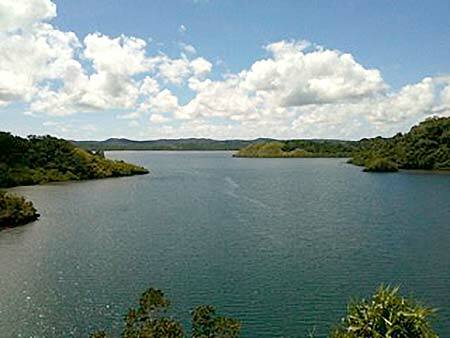 On their last excursion for the mission, the robot was taken up to a freshwater lake on Bablethuap. They were told that no one knows how deep it is and that scuba divers were afraid to go down once the water got too murky. Something about crocodiles in there I guess. They were working up the plan to bring the bot through the jungle to the lake when the ranger, or conservation officer, who is in charge of the lake told them it was 12 feet deep. 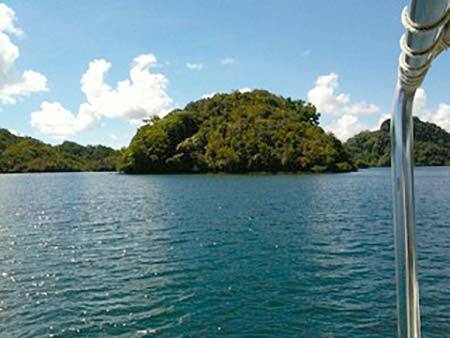 I guess the questionable depth of the lake is Palau’s version of The Loch Ness Monster. Today we split up. Pat went with the DPAA guys to show them last year’s find: a Hellcat and an Avenger. Drew, the archeologist asked for some orientation dives. They may not have the time to address both sites on this trip. Due to typhoons, aircraft malfunctions, the Japanese Emperor’s visit, etc., their mission length has been shortened. But the more investigative/prep work they get done now, the easier it will be for the next team. Meanwhile, Joe, Dan O’Brien, Jennifer and I went up to the Ngatpang Bay area. We were going to meet up with Dwi. Last year, Sorrence (Charlie the boat driver’s cousin) took us to where he said he said he had seen an airplane. He went snorkeling like aquaman from coral head to coral head but could not find what he was looking for. When Charlie called his other cousin, Dwi, he said Sorrence was looking in the wrong area. 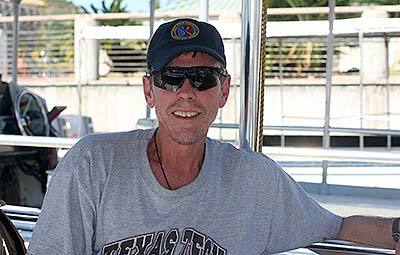 He would have showed us where to look last year but the tide was out and his boat was high and dry. And it was our last day last year. So Dwi met us today. He had the whole family out for a Sunday morning fishing excursion. 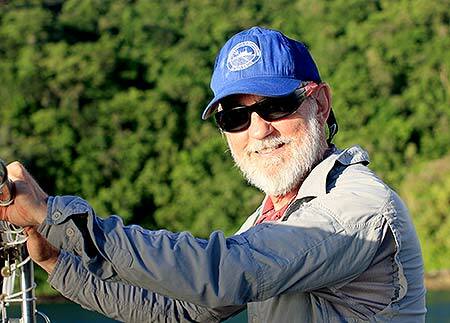 He looked, pointed, spun the boat around and told us through Joe and Charlie that it’s around here somewhere. And he didn’t exactly say he saw it. 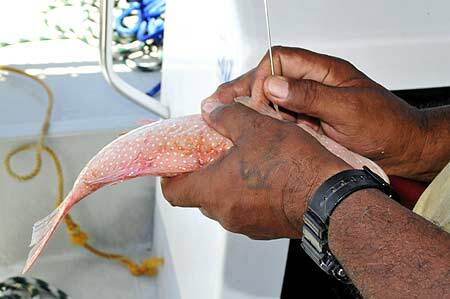 He said he was spearfishing and saw ‘something’ below him in the murk that looked man made and he assumed it was a skogi (skogi is Palauan for airplane). Well, this is a bit thinner. 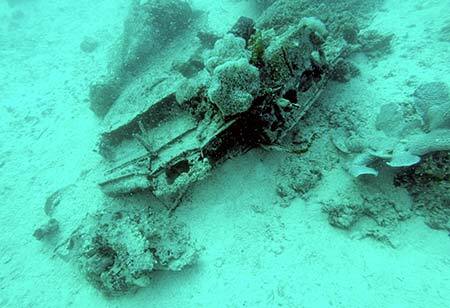 Except there are some airplane parts on top of the coral reef right outside Ngatpang Bay. One of the parts is a cylinder head from a radial engine. Call me crazy, but if an airplane loses one of those, I’m guessing the rest of the airplane isn’t too far away. 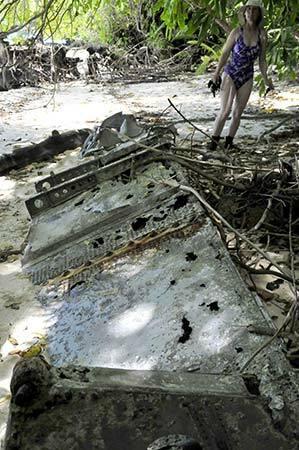 Then Dwi said he knows of a plane on top of one of the islands at the mouth of Ngatpang Bay. There is another airplane inside the mouth of the bay on land and he assured us he was talking about a different airplane. 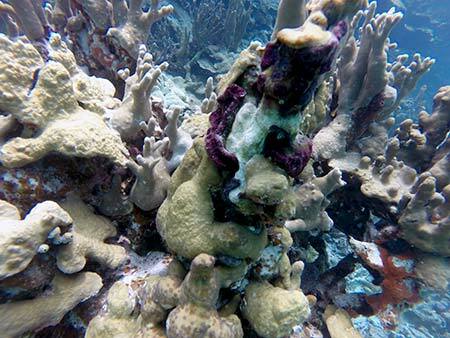 If you draw a line between Dwi’s murky shaped coral head area, the parts on top of the coral and this island, you could make a case that something happened here. there are reports of missing airplanes with no clue as to where they went down. Dan, Jennifer and I snorkeled Dwi’s coral head. 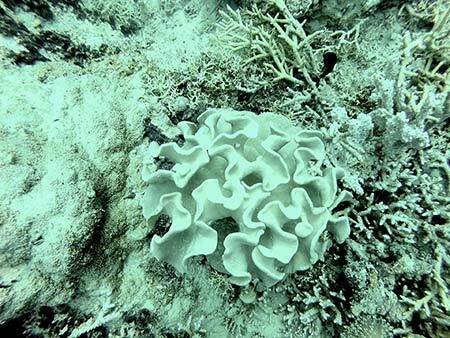 Good looking fish, nice coral, not too deep. Probably not the right place. Our first dive was the channel leading into Ngatpang Bay. 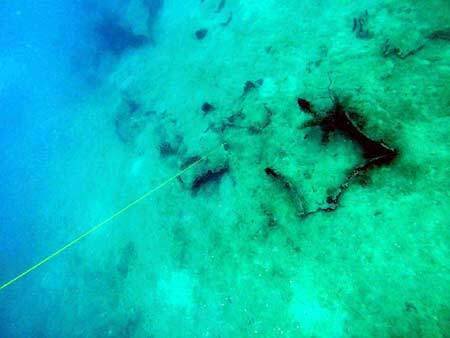 This naturally occurring channel is quite wide, steep walls, the transition zone from coral/rock wall to sandy floor is at about 105 feet and the channel bottom continues a gentle slope down to 150 or more. I swam the notch at the transition zone, Pat was on the wall’s cliff edge at about 60-70 feet and Dan was above on the coral slope. It was a fun dive. Great sea life, and we got to explore. And the visibility was greater than expected. But we didn’t find any parts. Back to home port. Cleaned up our gear and had dinner at The Drop Off. Met up with Margie and Dave of Bandidos Mexican Restaurant fame and got caught up on all the news that’s not fit to print. Then, being told we looked whipped, we all went back to the hotel and called it an early night. 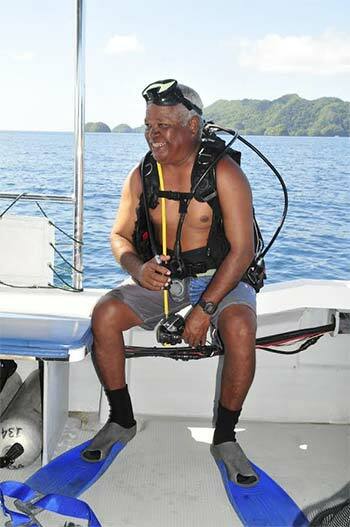 Tomorrow, the 13th, will be Dwi’s Island Excursion and maybe one last scuba dive. But for that, you’ll have to wait. Just in case I don’t get to it before our wifi is cut off, my final field report will be written enroute to Tokyo and if this laptop will connect, I’ll send it from there. 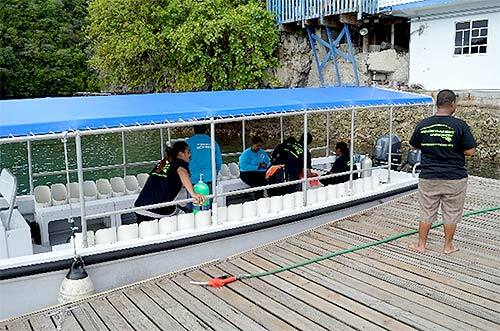 Today, we’re going to do everything: take care of admin things prior to departing, hike a jungle island, crawl through a mangrove and dive a murky channel. It just can’t get any better than that. Dan and Jennifer stayed back to take care of the admin things. Joe, Pat, myself and Charlie took the boat to Dwi’s Island to check out the top of the island where Dwi said there were airplane parts. It was low tide and we saw the remnants of a landing craft near where we found that one piece of metal yesterday in the water. 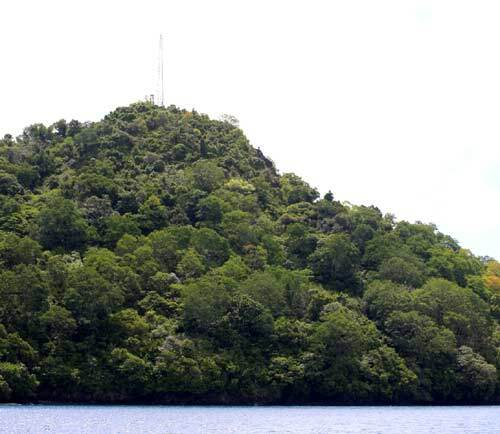 The island isn’t all that big, but it sure got steeper once we were on it. Looking out toward the outer reef and open ocean. The ground is not coral. So the good news you have less risk of getting sharp razor like cuts if you fall. The bad news is the top soil is still decomposing vegetation so footing is a problem And did I tell you it was steep? We got out, climbed the steep eastern end and started walking the summit. Actually summits. 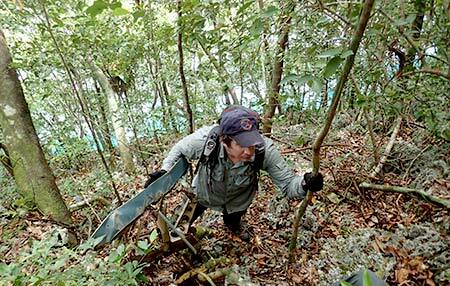 There were small ‘roads’ and trails cut through the top of the island in many places. So we would go around each, find a way to the top and take a look around. Then back down and do the next one. 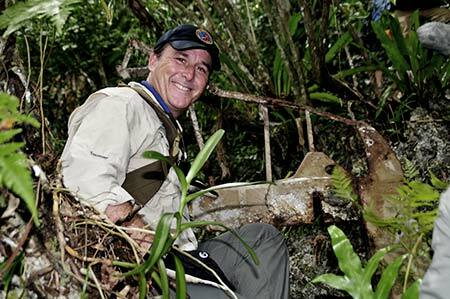 Of course Joe goes through the jungle like we walk through a park so he found the parts Dwi was talking about. Unfortunately, not aircraft. But Dwi’s reporting was spot on. We came down the west side of the island. Joe told us since the tide was out, Pat and I should walk the shoreline and he would follow the trail on the island. Pat and I did as directed and went through a mangrove. 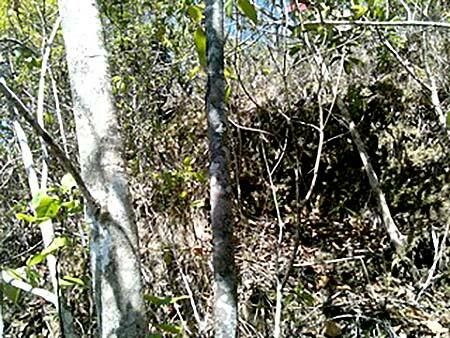 Okay, the mangrove was only about 3 to 4 plants and only 10 feet wide, but it was still a mangrove. 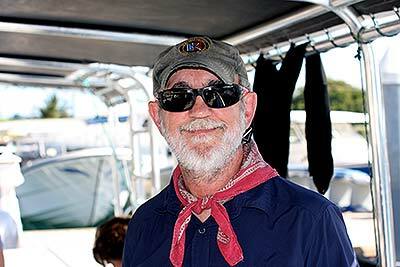 Back on the boat, back to home base we loaded the scuba gear and then had a lunch meeting. We’ve wanted to get together with Mason Whipps since we got here. So it worked out to have a lunch meeting on our last mission day. 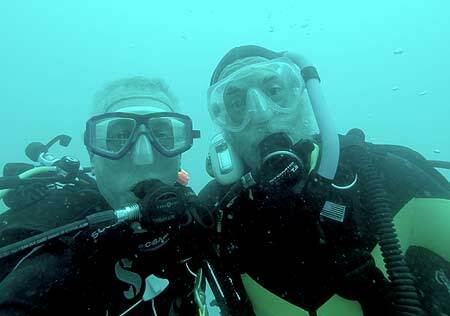 Once that was over, Pat and I went back to the boat for one last scuba dive. He wanted to make sure an airplane, specifically the Helldiver, wasn’t hiding in an area near the quarry, a spot we started calling ‘The Crack’. 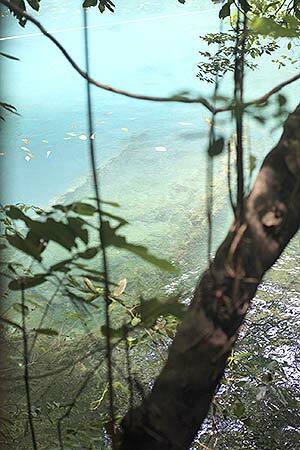 There is an underwater ridge that parallels the shore near the quarry. There are a few notches in the ridge that the underwater vehicles cannot get to. So we swam the transition zone along this ridge. 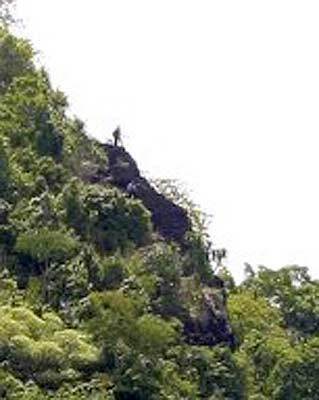 The plan was to go from the northern tip of the ridge to the southern tip on the eastern side of the ridge . Well, we still had air at the southern tip so we swam back to the start point but looking at the western transition zone. As you probably have guessed, didn’t see a thing. The visibility was pretty good considering the area. 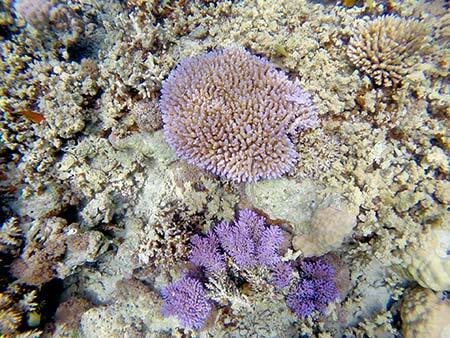 But I didn’t see many fish and there were very few corals at all. And no barracudas circled Pat. 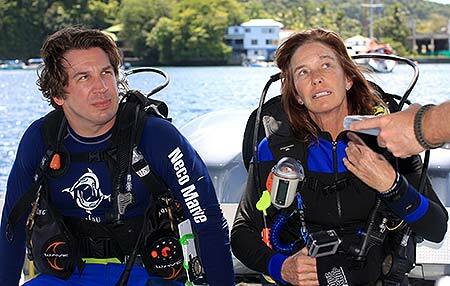 We tried hard to think of another dive to do, but said this was a fine time to end the mission. 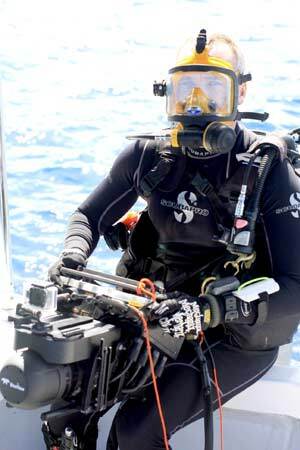 We went back to home port, took our scuba gear to the hotel and started doing the deep cleaning that the gear needs. Out to dinner with Cassandra and Steve from Cleared Ground Demining. 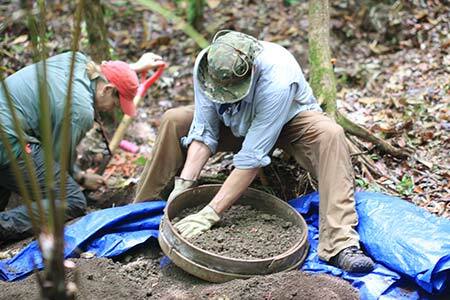 They are an NGO that specializes in gathering up unexploded ordnance in old battlefields and disposing of them. It was great to catch up with them. Now it’s back in my lonely writer’s garret. The first episode of the new season of Game of Thrones probably just played where you are. So it must be time to come home. 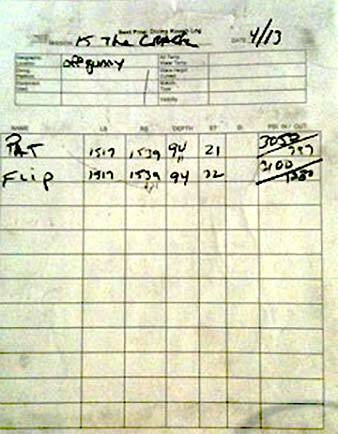 Pat, Dan and Jennifer’s flight leaves Palau at 0130. Mine leaves at 0430. That’s the awful part of the trip. No way around it. But it was a great year. The Stockbridge Students had a very successful mission. 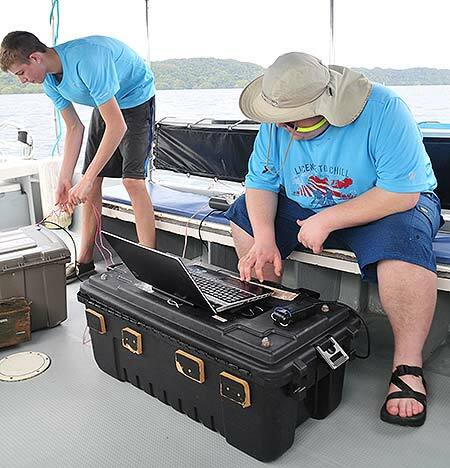 Over the four years they have come out to Palau with us, the students have gotten better at building and deploying their underwater robots. Although it looks like they’re going to take next year off from coming to Palau, we’re looking forward to having the team and their robot back with us again. San Diego State University had their first presence with us and the three students who came are busy writing their research papers. Since Derek Abbey, their advisor, facilitator, and faculty wonk, won’t cut anyone any slack, we’re sure the papers will say something meaningful. We got a lot of positive feedback from the locals here about their interactions and questions. The partnership between Scripps, UDEL, the Coral Reef Research Foundation and BentProp paid off again. We found an Avenger that we’ve been seeking for several years, which in with a crew of three airmen, for whom this is the first step in their journey home. 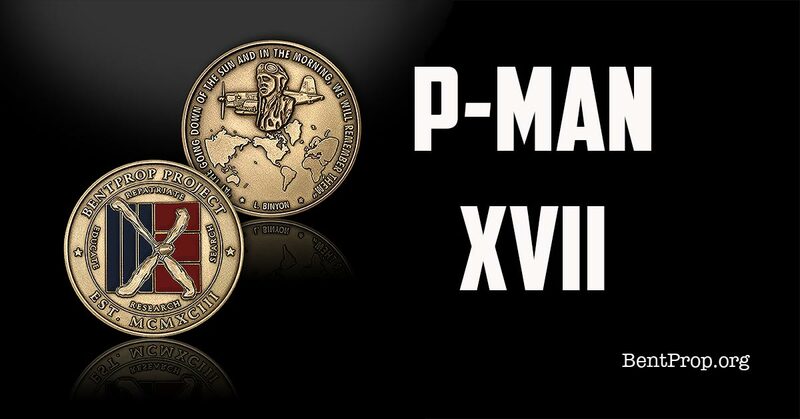 The Defense POW/MIA Accounting Agency (DPAA) is here. They’re about to concuct a recovery mission at the Hellcat crash site, which our partnership found last year. 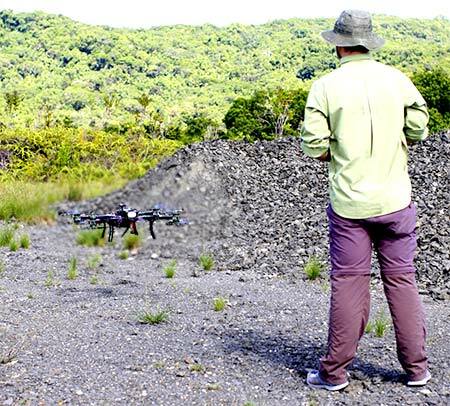 We’re hopeful that DPAA will also do recovery missions at the two Avenger sites before too much time elapses. Unless something wonderful happens tomorrow during our pack-out and admin day, that’s it for this year. Thanks for reading my musings. For updates during the year, please keep visiting the BentProp.org website, and consider making a donation. There are things a-brewin’ that may make for interesting reading in the future. But for that, you’ll just have to wait for the next update. By this time tomorrow, the last remaining team members will all be on the way home. Except Joe. He lives here. In paradise. Upon completion of the 2015 expedition, we received the following message and attached report from Josh Nichols, a 5th-grade teacher at Heritage Elementary (part of the Stockbridge Community School system). 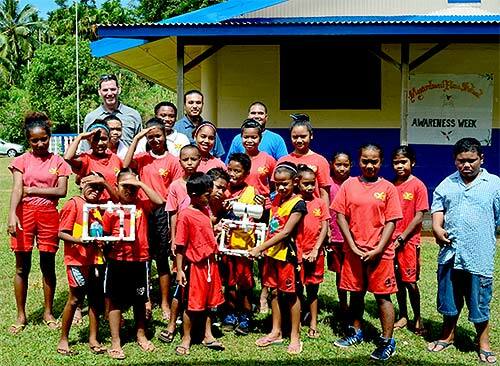 Josh accompanied the Stockbridge team this year in Palau. This is a *BIG* reason why the work that BentProp does is so satisfying. Flip always provides a field report of what goes on daily so I thought I would share with you what took place this year in the schools. Here is my final report for this year’s mission. 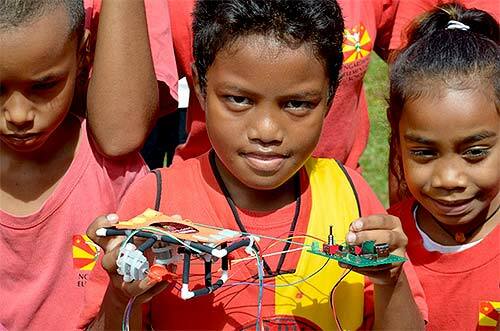 Once again, my heartfelt appreciation, and I look forward to harmoniously work with the ROV team in the future, and developing Palau ROV teams to ensure students’ learning success. Have a good night and I will be seeing you tomorrow. I will try and send the application tonight. I have finished with Neil Fisher’s, and three left. Thanks for the letter. It will be of great assistance. 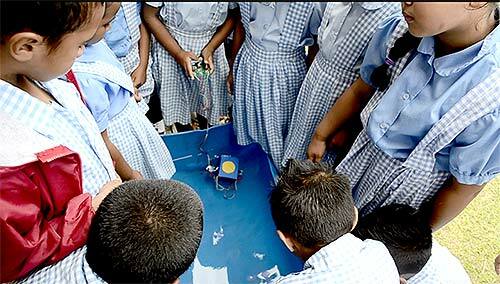 The students beat the teachers in building an ROV the fastest. 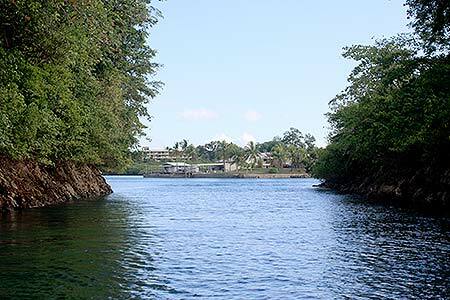 We left Ngardmau and headed to Sam’s Tours to meet Joel from Palau Community College along with two of his students. 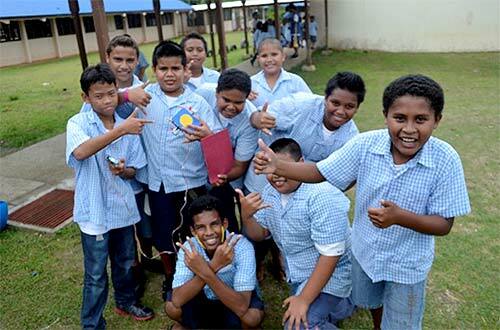 This year we made it a goal to meet with Palau Community College (PCC). I had the privilege of meeting with the Palau Community College President, Dr. Patrick Tellei. At first I thought the meeting was going south. 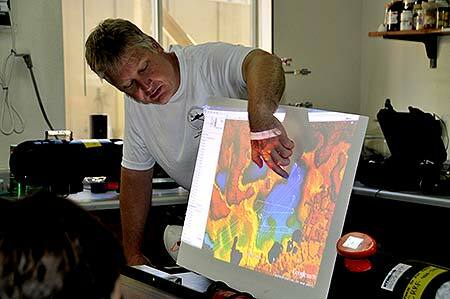 Dr. Patrick had a different take on ROV technology and I learned a lot from him. 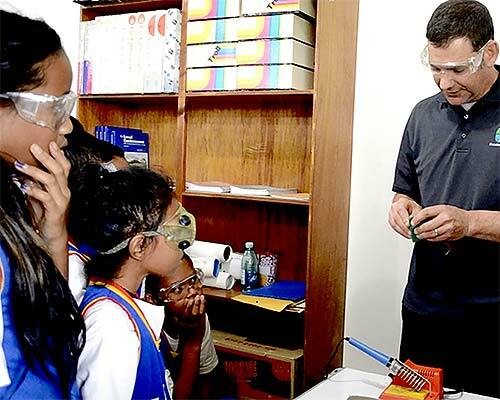 He was very concerned about ROV technology getting in the wrong hands. The Dr. feels that if the technology is introduced, it should accompany legislation. 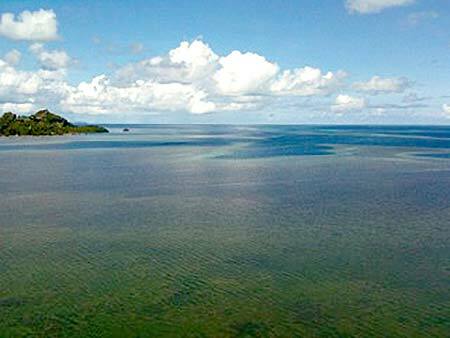 He expressed concerns about fisherman using it to find new spawning grounds. I listened and shared ideas of how the ROV can be used as a tool for research, how it is used as a tool to find planes and how it could be used to explore spawning grounds. After a few discussions about basketball (he noticed my height) the conversation ended with laughs and a direct line to one of his instructors. That is when I got to meet General Electronics Instructor, Joel Yabes. 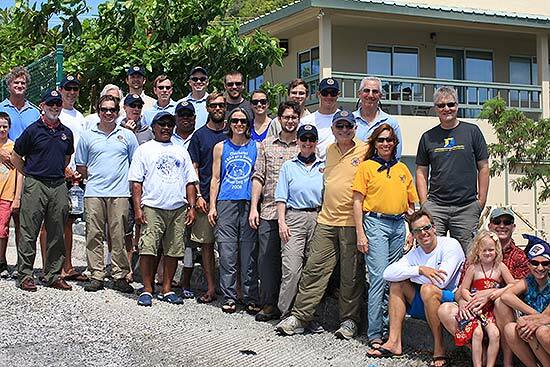 The Koror teachers and PCC all met at Sam’s Tours to head out on the ocean to test their new vehicles. All of the ROVs looked unique and were ready for their first swim. The Koror teachers headed out with me and the PCC group headed out with the Stockbridge High School students and Pat Scannon. Our goal was to meet at the Japenese Zero, but the tides had a different plan. 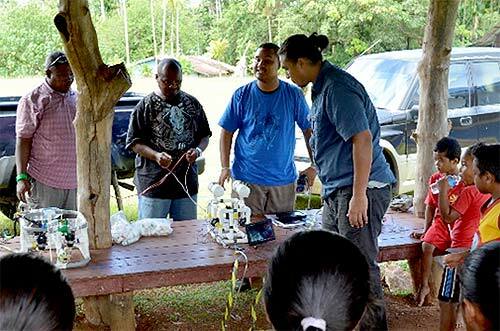 The Koror teachers headed to a sunken ship and the PCC group tested theirs at another location. 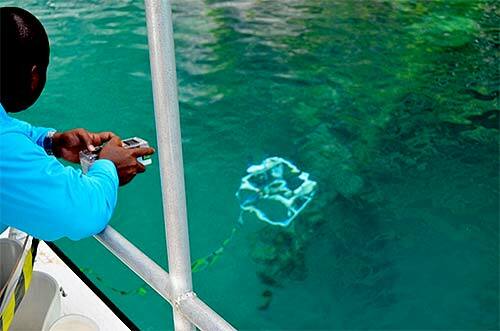 Both teams tested their ROVs, made changes and piloted them while they looked through their new camera and monitor system that they had built earlier in the week. Heading out on the boat. Sam’s tours provided a free boat! Thanks Li Li Tey!